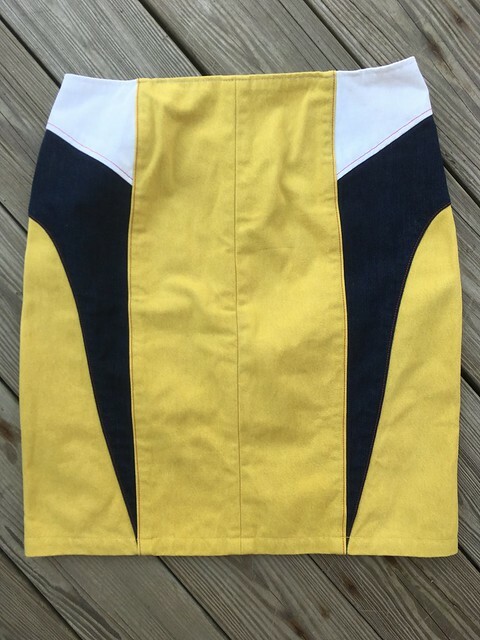 Fall has officially started (the autumnal equinox was Thursday, September 22), but I still have one more summer garment to share with you. I also have a few other projects I did during the summer, but those are great for any season, so we’ll save them for another time. Today I want to talk about these pants! 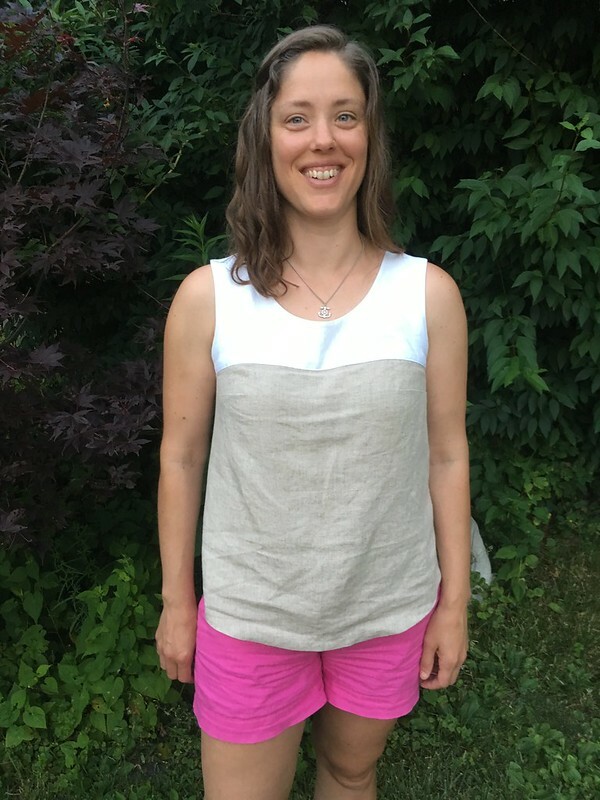 I really wanted some wide-leg linen pants for summer, and I also wanted to try sewing with linen, something I hadn’t done until I made this Datura blouse (also pictured). 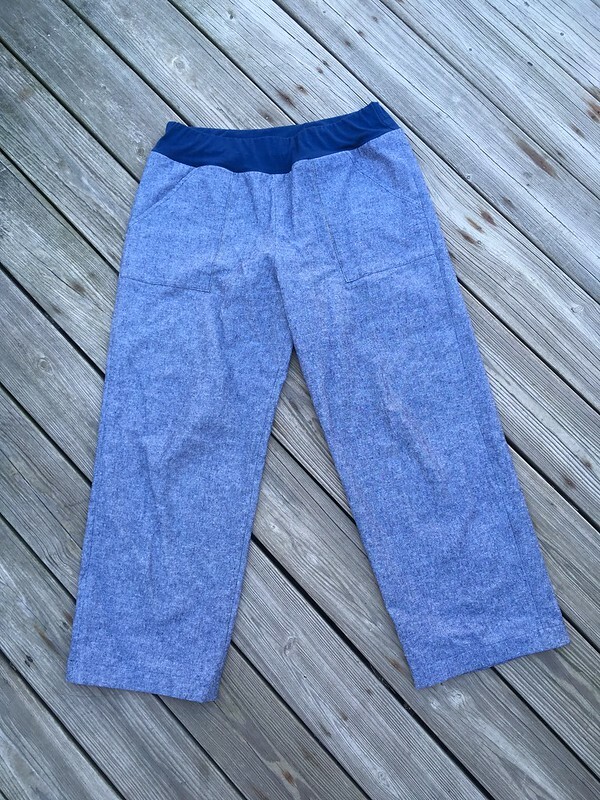 When trying to find a pattern for the pants I had in mind, I remembered some scrub pants I owned in college. They had a wide, straight leg and were the ultimate in comfort. 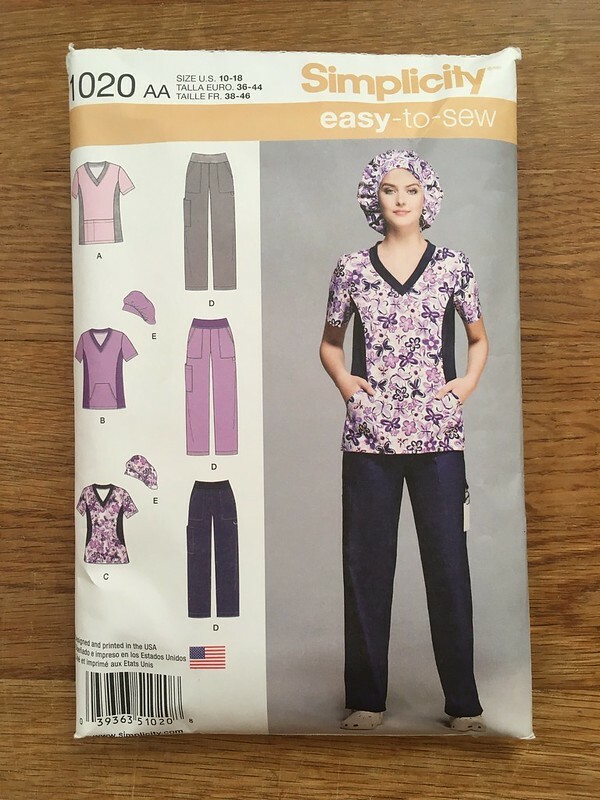 Since I hadn’t been able to find a pattern I really liked among the “regular” clothing patterns, I turned to the scrub patterns, and found Simplicity 1020. I figured I could use that and just leave off a few of the extra pockets, keeping the front and back ones. 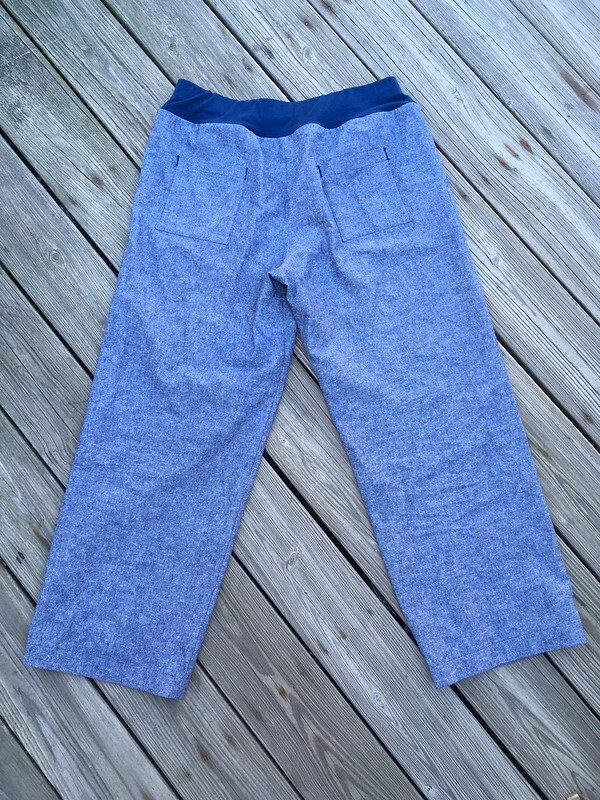 I found my fabric at Fabric.com–a Kaufman Essex Yarn Dyed Linen blend (55% linen, 45% cotton) in blue and a cotton/rayon (50% cotton, 45% rayon, 5% Lycra) knit in Indigo for the top of the pants. Other than that, I just needed elastic and thread, which I had in my stash. I made a quick muslin out of a sheet since I’ve had to do so many fit adjustments on recent bottoms, but while these could maybe have been tweaked slightly, they were good overall, and I decided to make them without adjustments. 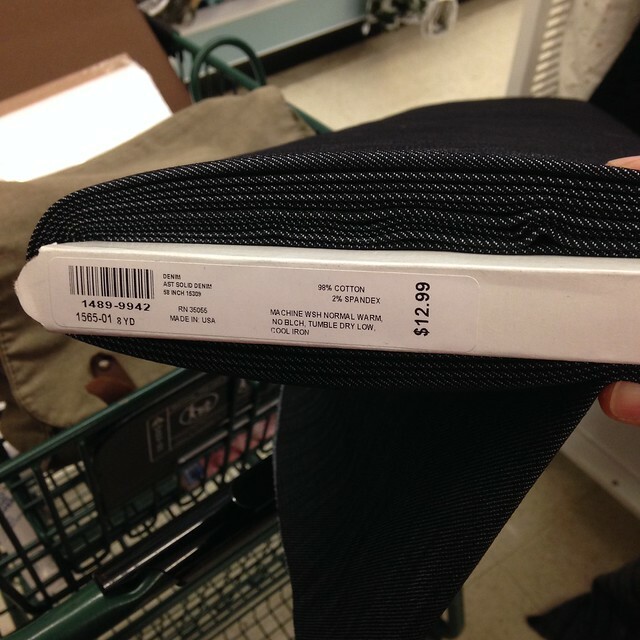 This makes me wonder if the Simplicity pants/shorts patterns will fit me better (i.e. 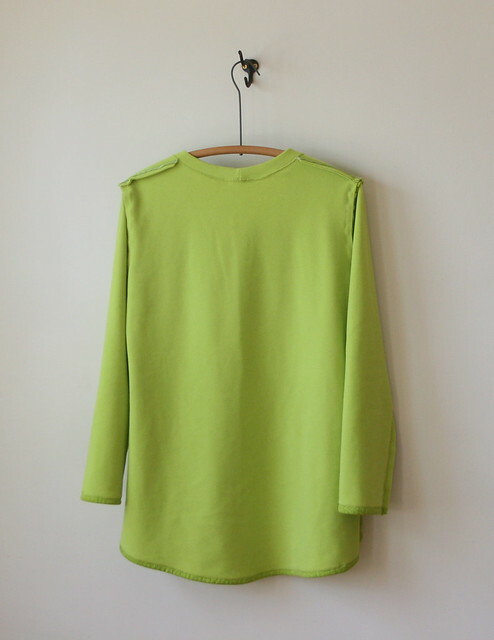 with fewer adjustments) than McCall’s and Butterick. I’ll have to explore that as I make more pants. The pants themselves were not too difficult to sew up, although I did prolong the process by finishing all my seams. Finishing seams used to feel like such a chore and while it still does sometimes, I didn’t want thready insides once these pants were finished and went through the wash. I used a turned-and-stitched finish (a.k.a. clean-finish) per the instructions in the Reader’s Digest Complete Guide to Sewing. 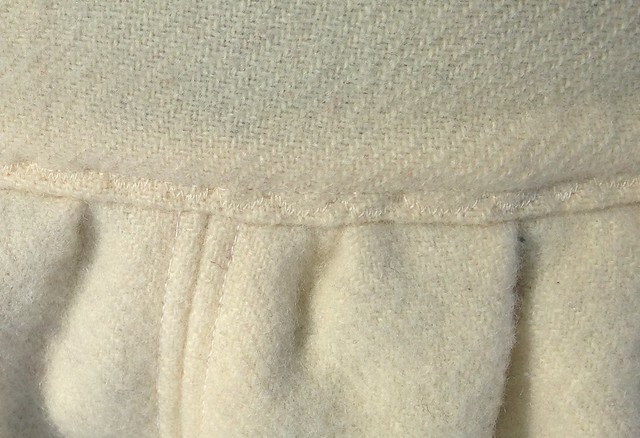 The linen seemed too thick for French seams, although I’m open to hearing about other finishes people have used. 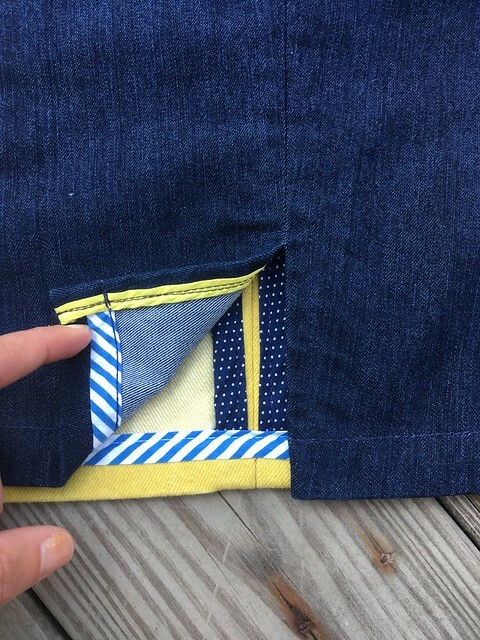 I also basically did a double turned hem for all the pockets and then topstitched them on so that I wouldn’t get threads in the pockets, either. 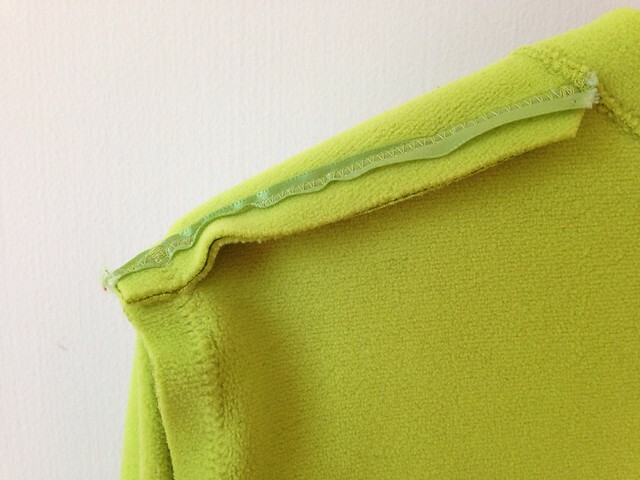 Last, but not least, I covered the seam where the main pants fabric joined the knit waist fabric with bias tape. I think my only question on the whole thing is the hem length. If I had hemmed these at the suggested spot, they would have been long, but probably good with heels. I turned them up one more time so I could wear them with flatter shoes, and I think that is the right length for lower shoes, but sometimes, at some angles, they look a little bit like floods. (Wow. 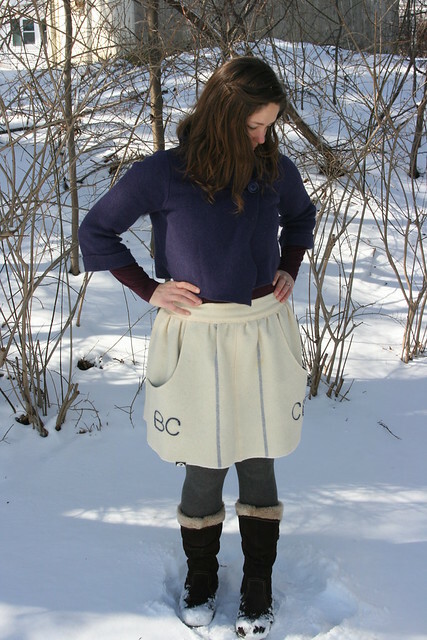 I just used Google Images to look up “flood pants”. It was a little different than I expected, but I think my statement still stands.) I didn’t actually cut my excess off the hems, so if I change my mind later, I can rehem them to be longer. I’m done with them for this year, though. 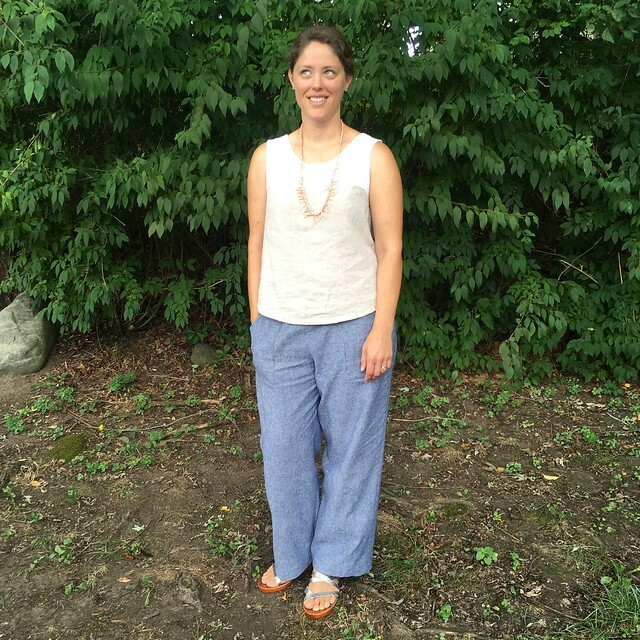 These pants are super comfortable (secret pajamas for the win!) and they wrinkle much, much less than I thought they would–maybe because of the cotton blended in? I think of cotton as pretty wrinkly, but who knows? Maybe because of the midweight? I don’t know. Whatever it is, I’m happy with them. 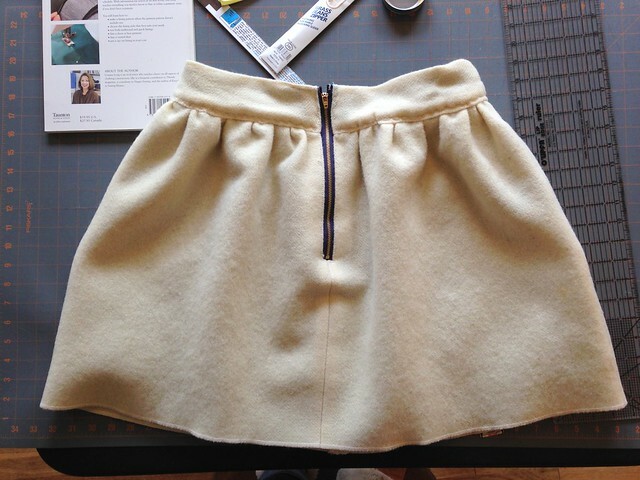 Now it’s on to fall sewing! 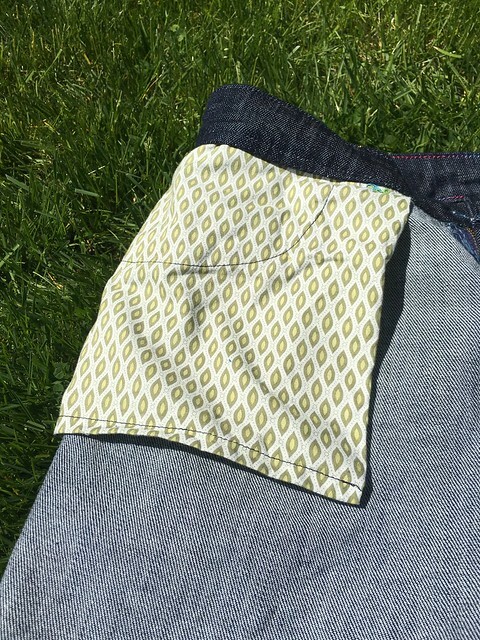 Here’s one more post from Cotton + Steel about the fabric called cotton lawn. Sounds like lawn is a winner for your button up shirt needs. 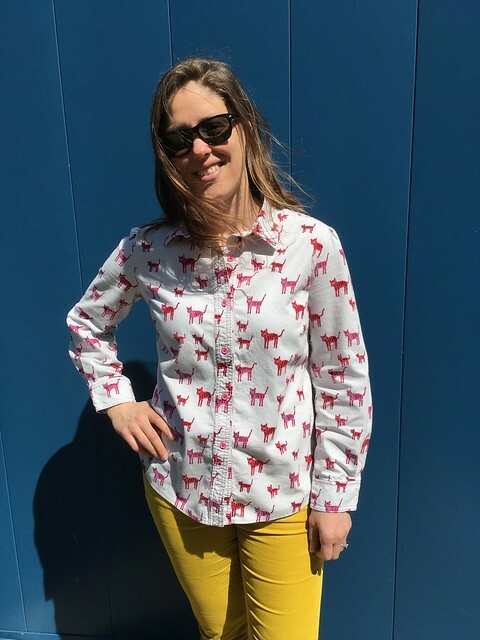 If you are a garment sewist in fairly close proximity to Exeter, NH, you might enjoy the Pattern Review Meetup happening at Pintuck & Purl this Saturday, September 24 from 2-4pm. Jellyfish or jelly fish? Be careful how you say it! 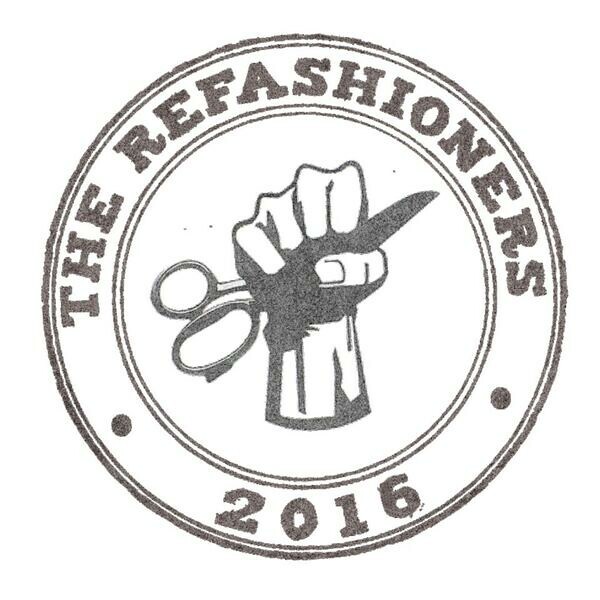 It’s finally time to talk about The Refashioners 2016! I’ve been waiting a long time to share my #jeanius project with you. 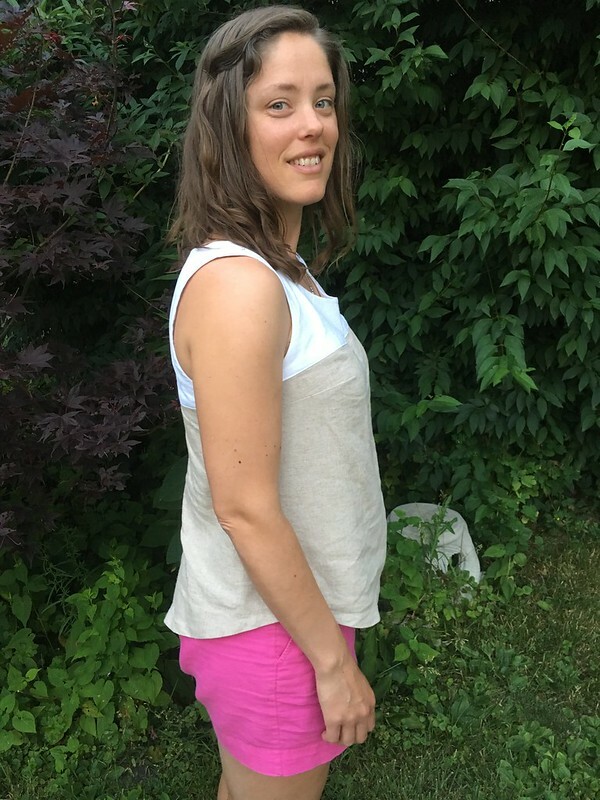 The Refashioners is a challenge created by Portia Lawrie of Makery that showcases creative ways to refashion whatever the chosen garment for that year’s challenge is. If you’ve been following along, you already know that this year’s garment of choice is jeans (#jeanius!). Check out what I made! 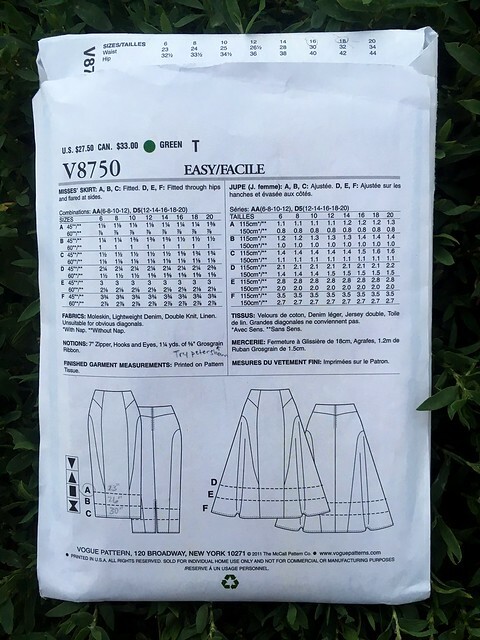 I’ve written about my creative process over on Makery, but if you want more details on working with the particular pattern I chose, Vogue 8750, you’ve come to the right place. As soon as Portia sent us our brief for this year’s Refashioners challenge, the gears in my mind started turning. My local big box fabric store was having a pattern sale, so I went down there with notebook and pencil in hand, sat down in front of the big pattern catalogue books, and started making list. 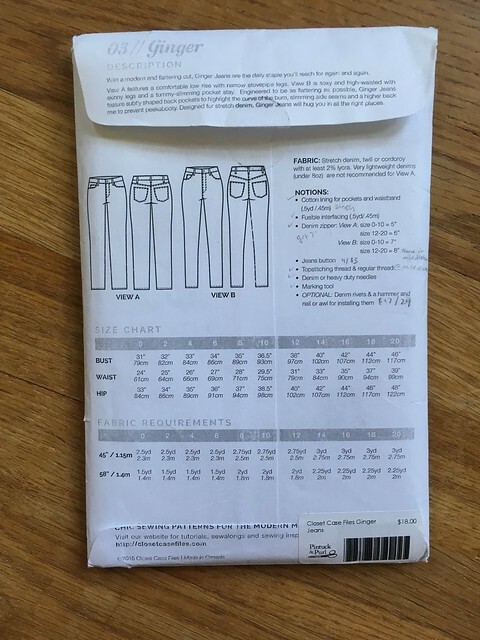 Lists and lists of patterns that I might be able to create out of different pairs of jeans. I decided to look for something that had multiple narrow pieces so I could cut them out of jeans legs. 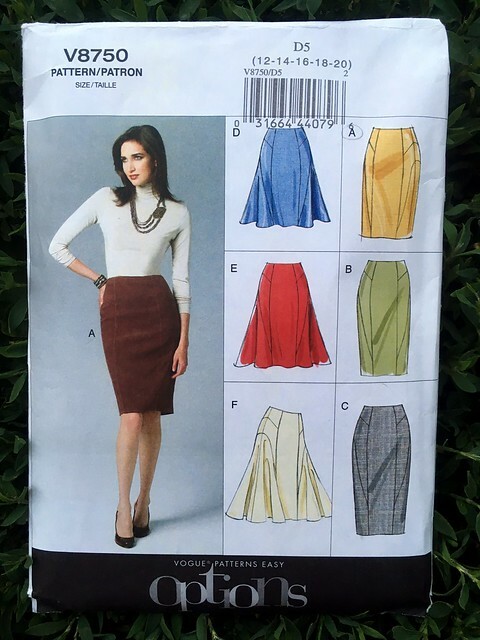 I finally settled on Vogue 8750, a skirt pattern. I chose View A, which is the shorter (but not actually short) pencil skirt. This looked like it had a lot of possibility for color-blocking, and I was hoping to find some super-cool denim at my local thrift store. 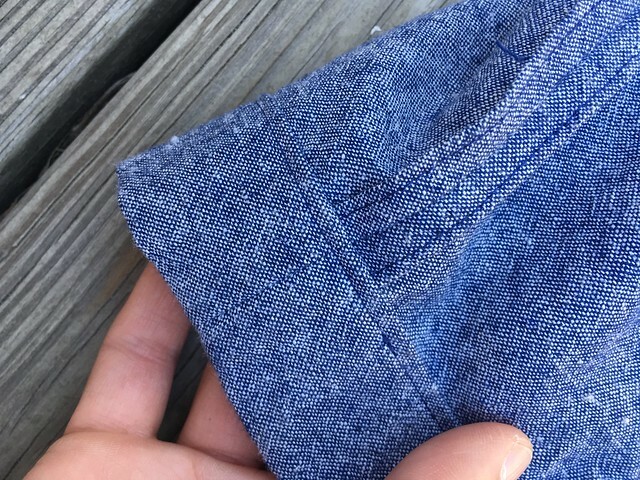 With the help of a pattern and all the inspiration on my then-secret Denim Pinterest board, I went to my thrift store looking to find some railroad denim or…something inspiring. 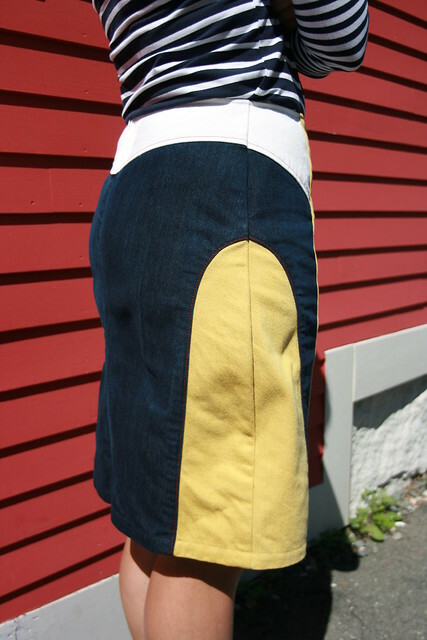 (I have a little railroad denim obsession at the moment). No railroad denim. But I did find…THIS! 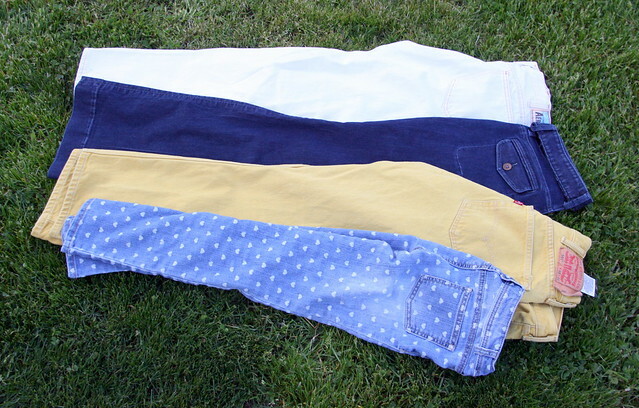 Yellow denim, white, denim with hearts, and my own older pairs of dark blue. Now it was all coming together! 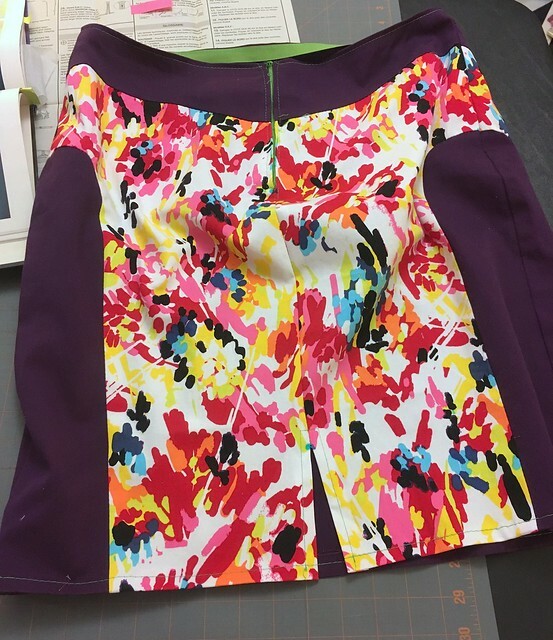 Last year’s Refashioner’s contest helped me make a move up from beginner to intermediate sewist. However, still not being super experienced, I don’t always make a muslin. (Who am I kidding? I skip it whenever I can.) I know…I know… It’s helpful, and I’m moving in that direction, but I’m not there for every project. I actually DID make a practice garment for this one, though. I made two, even! The first showed me that I needed to size down. 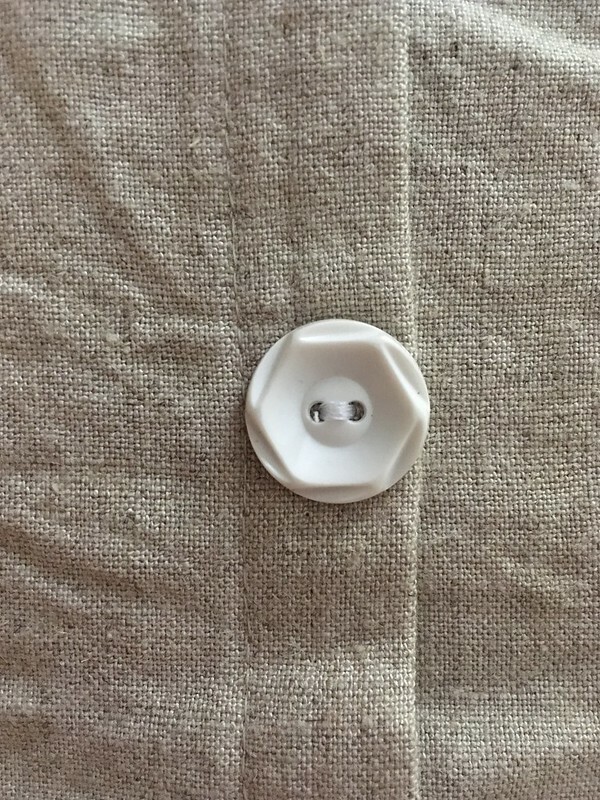 A lot of people say they find this with Big 4 sewing patterns–I typically don’t, but in this case it was necessary, so it’s a good thing I made a muslin. I used the second muslin to try lowering where the skirt sat on my hips and practice putting it all together a bit more. 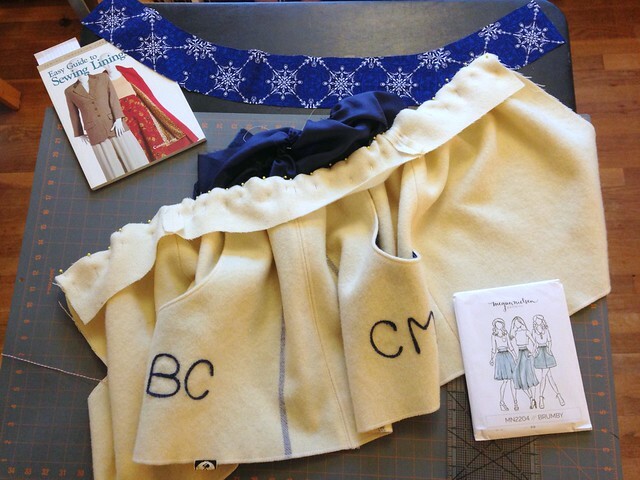 The pattern tells you to ease the top of the skirt to the ribbon facing, but I had a lot of trouble with this and didn’t really want the skirt up at my natural waist. 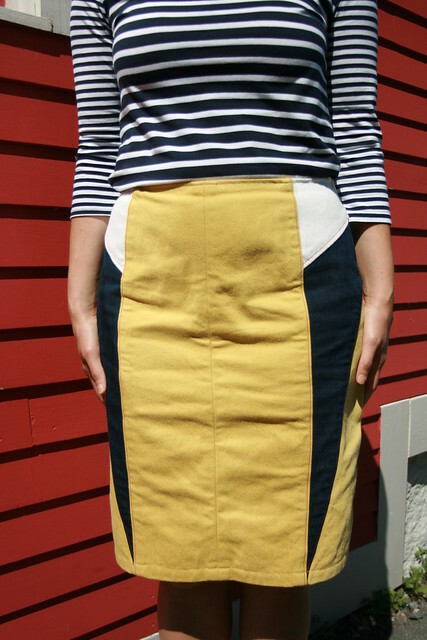 I found that skipping the easing and just cutting a ribbon to match the top of the skirt solved both problems. 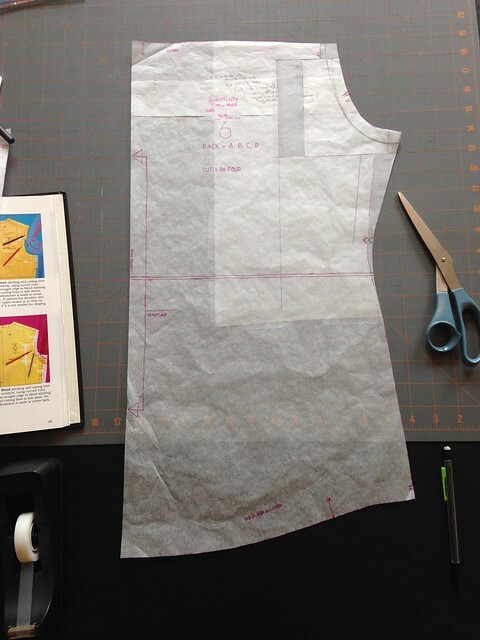 Muslins can also be a great way to procrastinate on cutting into your final fabric while appearing busy. 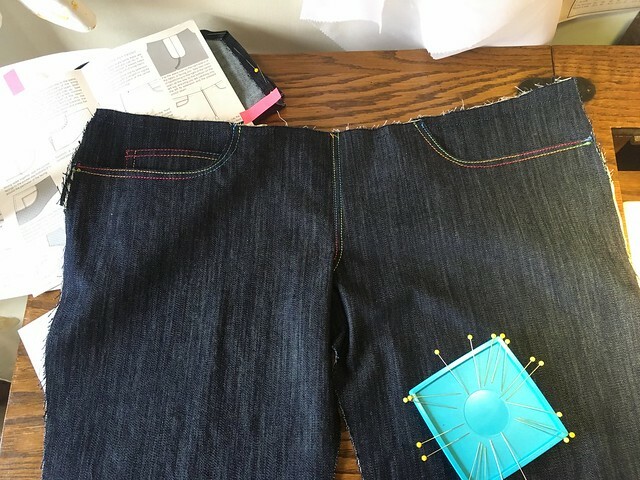 😉 I finally got up my courage, though, and found that I could easily fit my pattern pieces onto the jeans I had chosen (large men’s jeans for the white and yellow). I tried out using one pair of children’s jeans for my middle panel, but had to backtrack when I saw that it just didn’t work. The thing I wish I had done (and I’m still not sure how or why I didn’t after two practice garments) was think about how and when I was going to finish my seams. 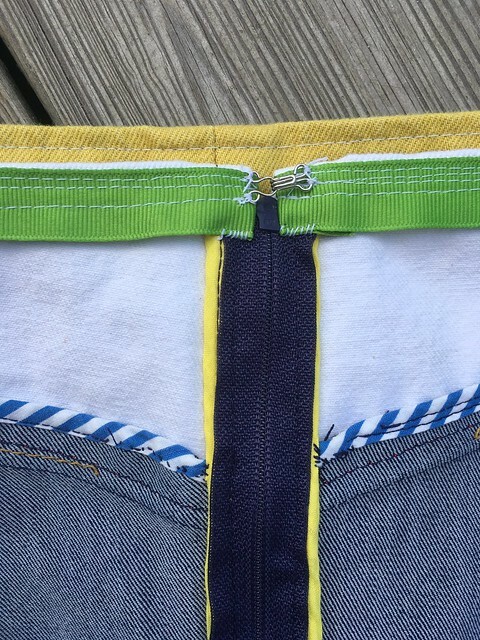 I realized part way into my final draft that I really wanted to bind the edges of the seams with bias tape. This is something best done as you go along and before you join various parts. 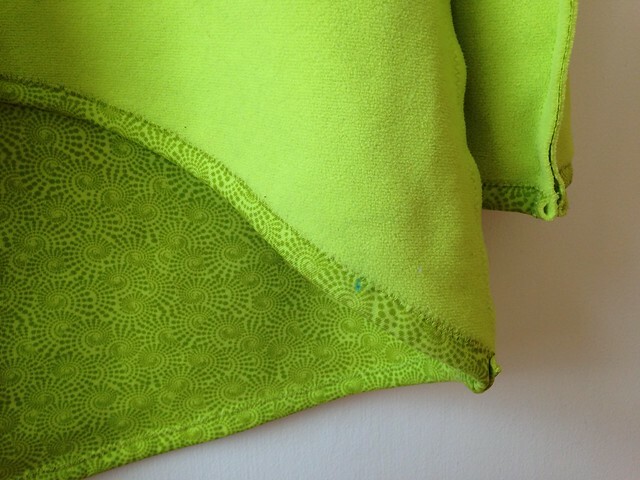 You can see a few places where my bias binding doesn’t go all the way to the edge of the seam. Lesson learned. I actually contemplated starting over when I realized that (plus, I was getting pretty good at making this pattern after a couple of versions), but it seemed to defeat the purpose of refashioning to throw an otherwise good garment-in-the-making out because of one little detail. 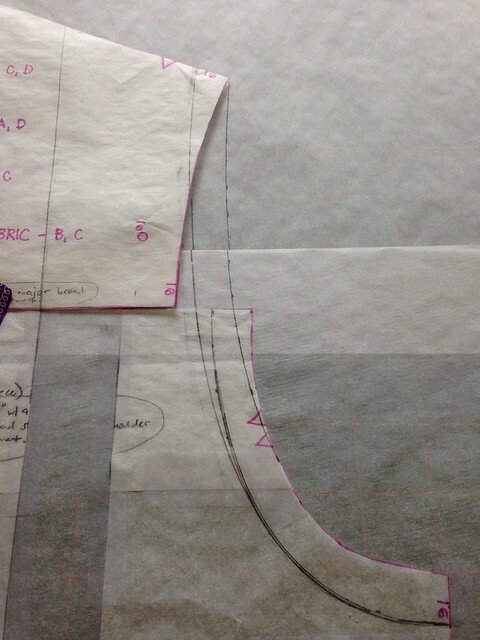 The other interesting thing I discovered was that sometimes, in matching up seamlines (namely on the sides), it wasn’t about moving the pieces up or down to get them to match, but making the seam allowances the correct width for them to match. One of my sides matched immediately, and the other took several passes through the machine, taking the side in millimeter by millimeter in order to get it to match. 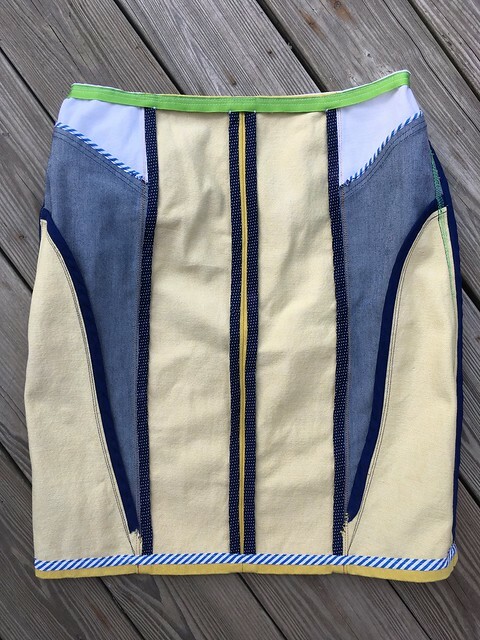 The skirt in-progress looked messy and crazy, but as I got things lined up, trimmed and bound my seams, and finished edges, it came together into something that looked polished. My favorite thing about this challenge is that it makes me think like an artist. You get your parameters, but within them you have freedom. How far can you push it? What will you do to make your garment distinctive? Will it be simple and sleek or heavily embellished? This is what I talk about in more depth in my post on the Makery blog. If you haven’t already, I hope you check it out and look through all the other posts as well to get some inspiration. What do you think? Will you be diving in? There’s a pretty tempting prize package! Last, but never least, thank you to my photographers–my husband Scott and my friend Colleen. I appreciate your help SO MUCH! Hey, friends! Happy July! I can’t believe it’s July already. I feel like summer is just starting. I’m going to take the rest of the month of July off from blogging (although you can still find me on Instagram @lisa.poblenz). 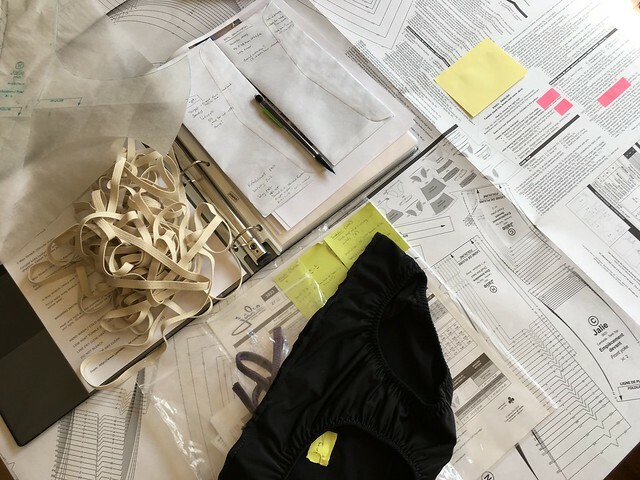 I’m coming off a number of complicated sewing projects (Refashioners 2016–which you’ll get to see in the not-too-distant future, bathing suit sewing, jeans, etc. ), and it’s time to regroup, create some new garments, and do family stuff. I don’t know about you, but when I finish a big batch of projects, I feel a little discombobulated for a while until I figure out what direction I’m going to pursue next and get going down that road. 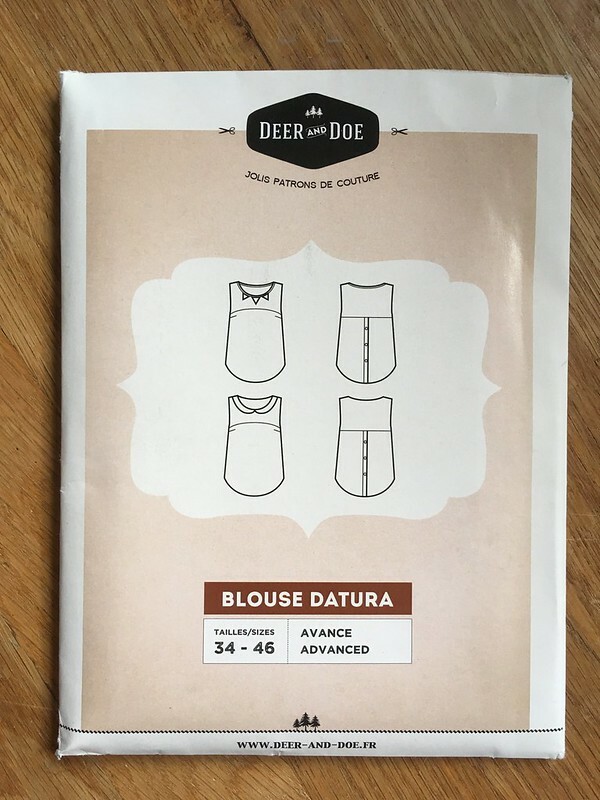 I finished one wonderfully quick project on Wednesday, however–a Deer and Doe Datura Blouse. I’m finding that while I am most drawn to bright colors and fun prints, I need a few neutral garments to wear with the fun and crazy stuff. 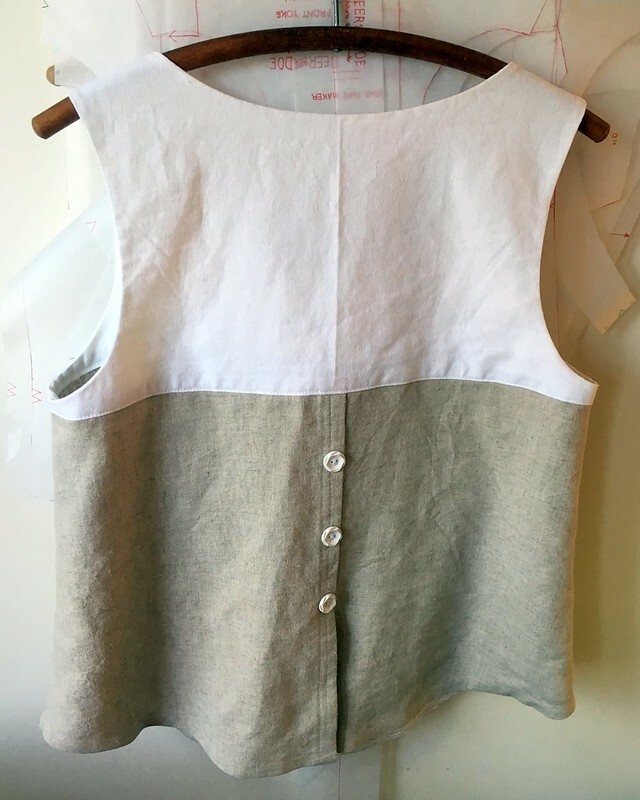 So, to test out this pattern, I chose the most basic view and made it up in a white linen-look fabric from Joann’s that I’ve had forever, and a khaki linen that a good friend gave me. I also took the opportunity to use some vintage buttons from my mother-in-law. 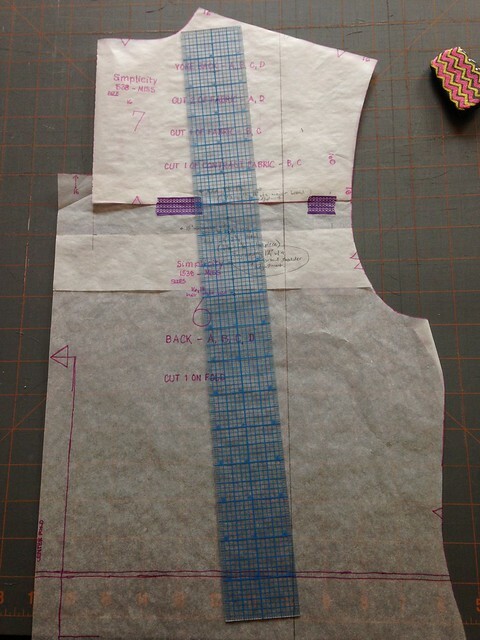 Before beginning, I measured myself to see how high the dart should sit on my body and then checked it on the flat pattern. It seemed perfect, so other than grading up a size for the waist and hip, I used the pattern as it was. There were a few tricky parts, mainly having to do with sewing together the shoulders, but once I weathered those, it was a quick sew. 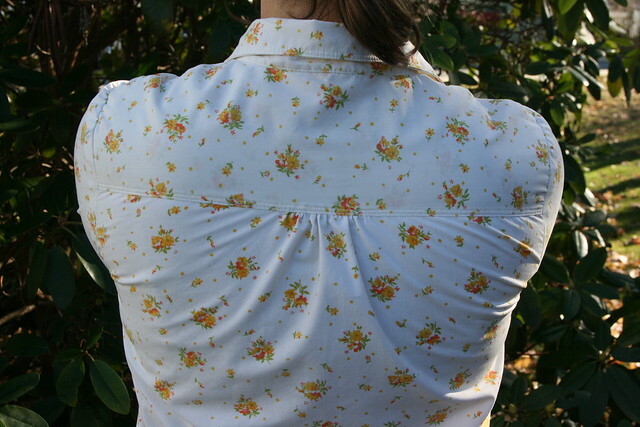 (I used Part 1 of this sew-along to help me out, in case you are considering making this top as well.) 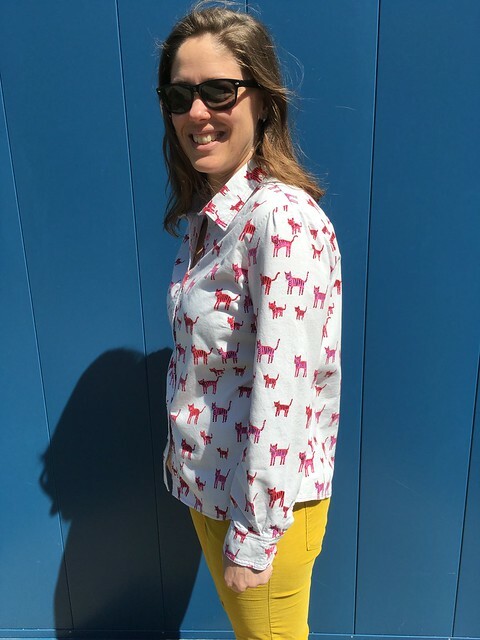 The only potential issue is that the neckline seems to gape just a bit, but I’m going to wash and wear the shirt a few times before I decide if I need to deal with that in any future versions. They’ve updated the pattern since I bought this one, so maybe they fixed that. I’m not sure. Do you ever wish you could sew at super speed? I’ve never really had a handle on my summer wardrobe, but after sewing for a few years, and thinking seriously about what I actually wear (rather than just what I like to look at in fashion, which are often two very different things), I think I’m getting closer to the essence of how I like to dress in summer. And now I want to sew it all up!!!! I’ve been stocking up on fabric, but I can’t yet sew at lighting speed or fit garments to myself with shocking perfection. Alas, my reach exceeds my grasp (but I think they are getting closer!). Ah, sewing problems! Ha! 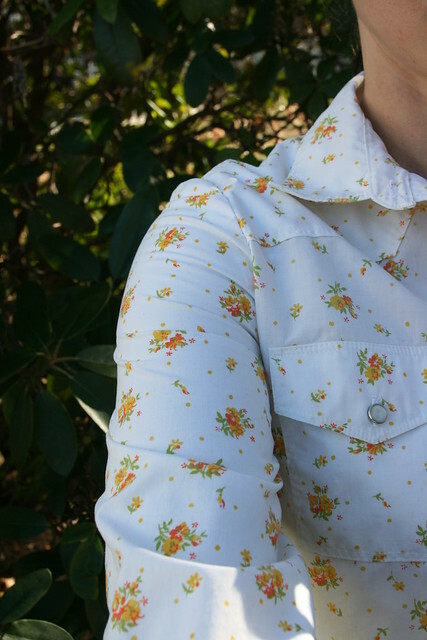 This Piped Floral Shirt Dress from Making It Well is amazing. I’ll have to pick up some tips from Jo when I finally dive into the wonderful world of shirt dresses. I just have to recommend The Great British Sewing Bee. As much as I love Project Runway, sometimes it’s just so…ruthless! The GBSB has a much kinder tone as well as an educational one. I’ve only watched Season/Series 1 in its entirety, but Series 4 is on now! You can look at the show’s website here. If you are in the greater Boston area, I highly recommend the magazine edibleBOSTON. 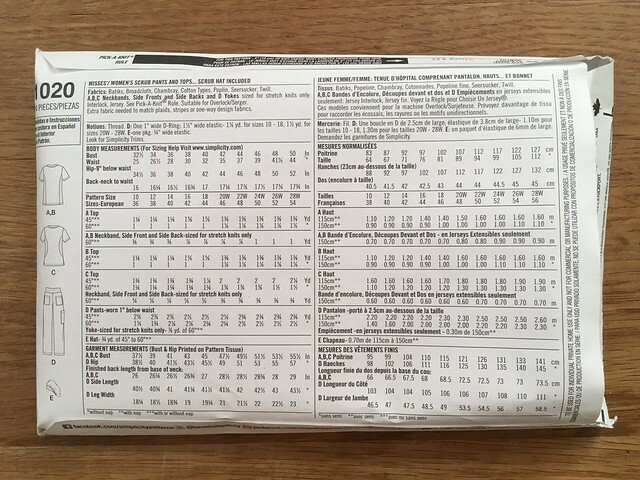 If you aren’t in greater Boston, you may have an edible magazine covering an area near you. edibleBOSTON is a fun way to learn about farmers, restaurants, small batch food makers, and other foodie things in your locale. Magazines are free from subscribing businesses and come out quarterly. You can also read issues online. Aaannnddd…..we’re TOTALLY making this spaghetti and meatballs recipe this summer! It happened! 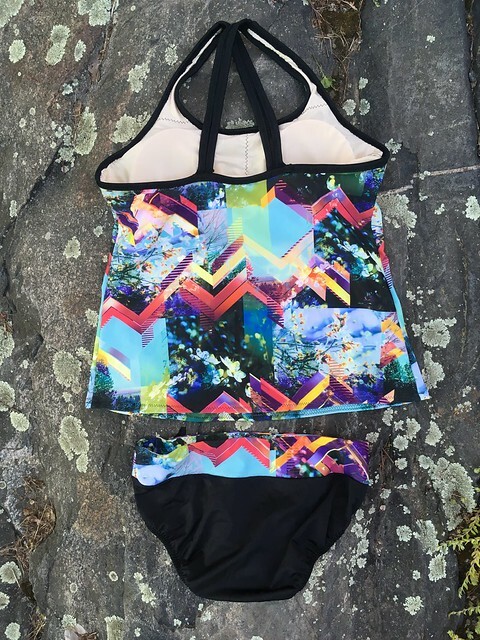 I finished my bathing suit and…I think it works! When we last met here, I had finished the bottom, but not the top. During this week, I worked on joining up all the pieces and adding elastic to the neckhole and armholes. That last bit wasn’t a part of the pattern, but I really like the look it provides, and I was hoping to solve a few problems with it. There was a small part on the front neckline where I didn’t catch my outer fabric very well when I was sewing all the layers together. There was no invisible way (that I could think of) to fix that. Even using clear thread, it would have been visible. I also wanted to stabilize those openings and give them more support so that they would be stronger and hopefully not gape when wet. Finally, I was hoping the edging would magically tighten and take in the little bit of excess under the arms. So…that didn’t happen (which I expected, but you always hope for that happy accident! ), but I’m more optimistic about the other things. When I began to apply the elastic, I realized it was a make-or-break moment. The suit would either be much better for the addition or it would be ruined. I bet on the side of better and went for it. 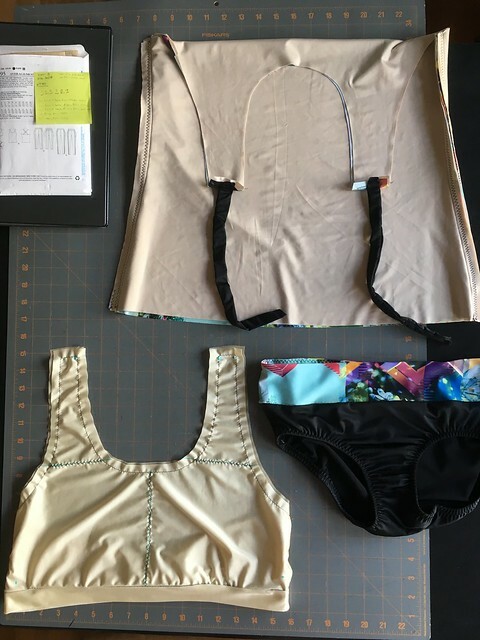 After letting go of my perfectionism, I ended up with a swimsuit that isn’t perfect, but is actually finished and is, I think, a wearable first draft. I’ve tested it briefly. Now to see how it does over a whole day at the beach. 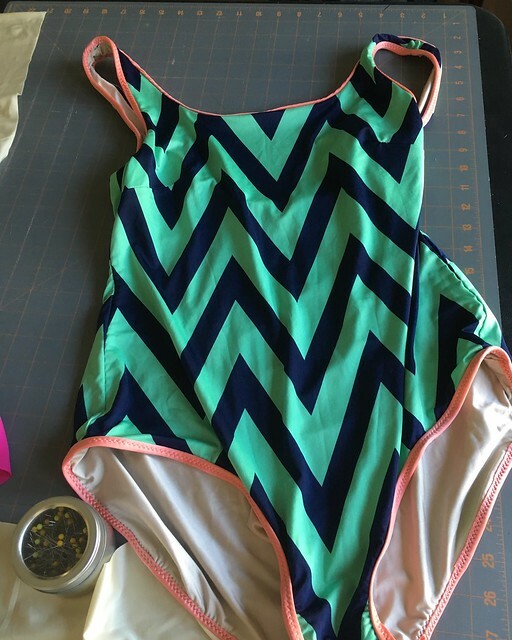 If you happen to be working on your own bathing suit and want to try applying elastic like I did, check out this tutorial on the Kadiddlehopper blog. 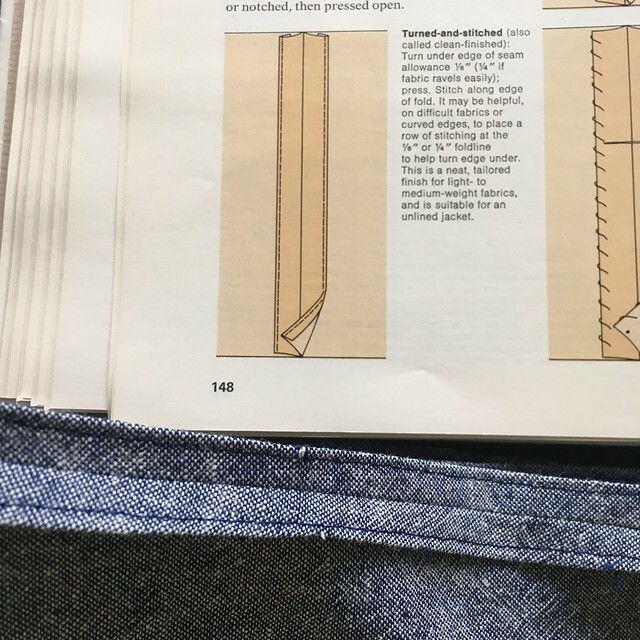 I used the advice here on both the stitched and turned elastic for my leg holes as well as the bound edges in the top. I actually have this blog post printed out and saved in a binder so I don’t lose it! As for the few other details on this suit, here they are: I fully lined both the front and back of the top and bottom. 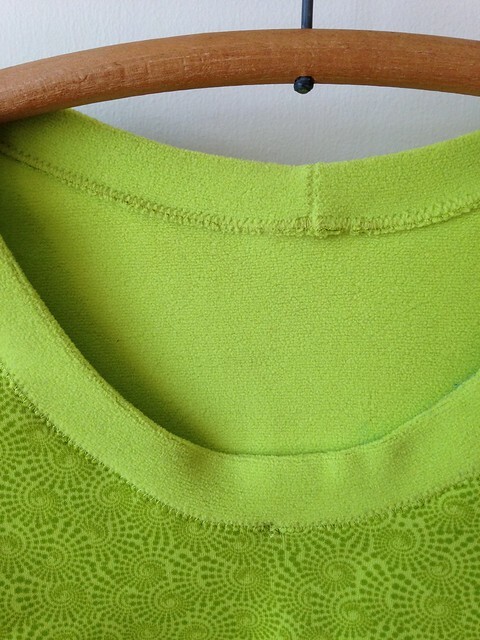 I also used powermesh from the Imagine Gnats shop as the lining fabric in the built-in bra of the top. I have nothing but good to say about buying from there–super fast shipping and great service. All my elastic was 3/8″ swimwear elastic, and I used wooly nylon thread in my bobbin, with 100% polyester Güttermann thread in the top. 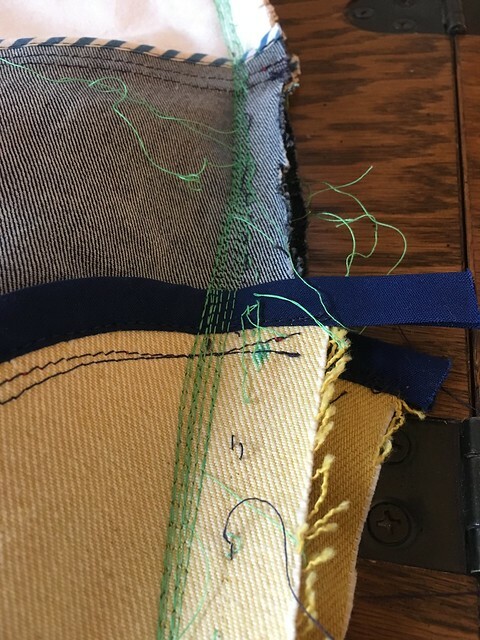 I used a walking foot, plus a stretch needle and Jalie’s method (found in the pattern) of sewing a long zigzag stitch first (width: 4.5, length: 0.5) and then going back and doing a straight stitch while stretching the fabric slightly (length: 2.5) at the actual seamline. 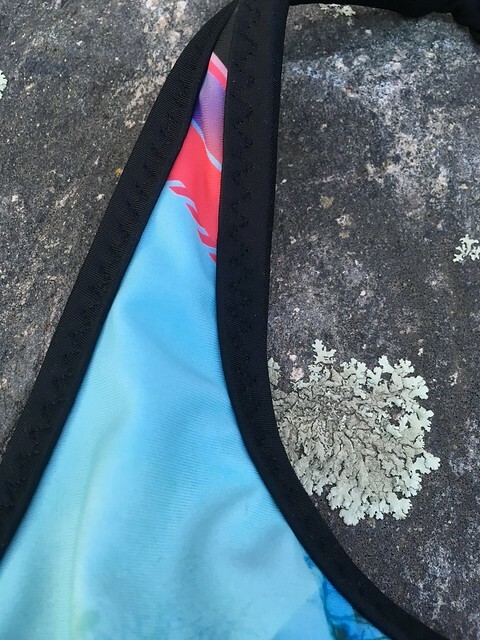 For pattern and fabric details, see my first post on this swimsuit. If you have any questions, feel free to leave them in the comments and I’ll do my best to answer them. Thanks to everyone who encouraged me! It means so much, and it really helped me finish well. 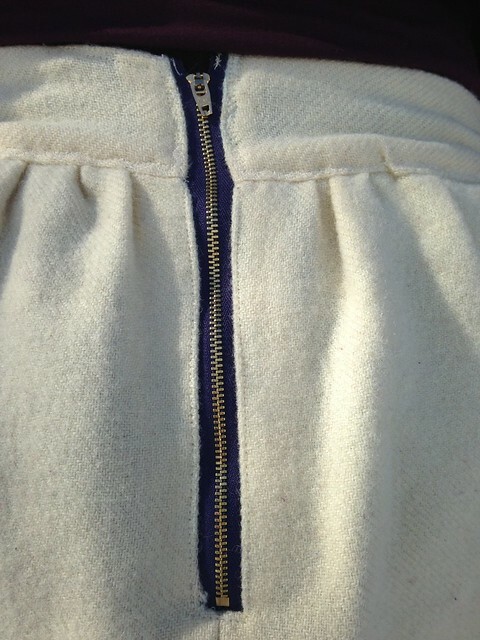 My neighbor’s mom, who I just love and who is an amazing seamstress herself, is now convinced that I can sew anything. Little by little, right? Here’s some fun for your weekend. I have really been loving the Instagram feed of @suzyquilts. There is something about her bright and beautiful pictures and her patterns…and I don’t even quilt! (Well, I do have a quilt that’s been in-progress since 2008, but I’m talking quilting as a regular practice.) I love the stripes she uses in her Kris Kross quilt. Tempting… You can also find her website here. 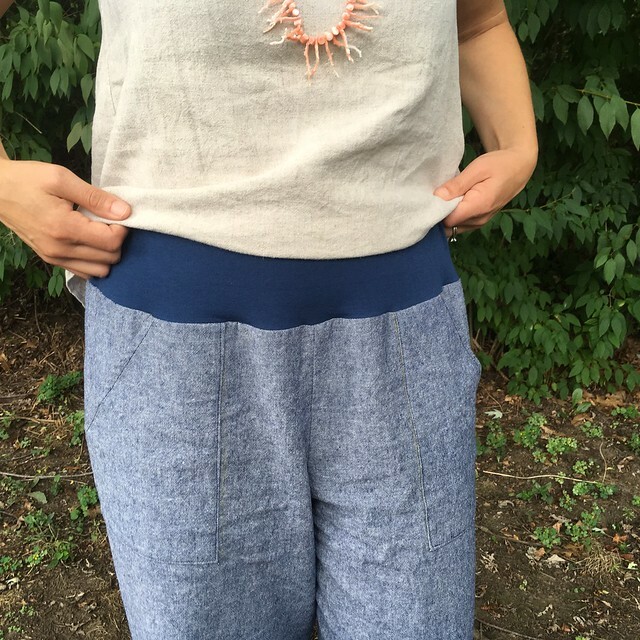 If you like the crop top look, but not the idea of baring your midriff, Allie J. will show you how to “make your own (fake) crop top” in this tutorial. We like thinking games in our house, and one of the games we play on the iPad is Monument Valley. They bill it as “an illusory adventure of impossible architecture and forgiveness”. It feels a little bit like trying to figure out an M.C. Escher visual puzzle with calming, completely non-scary background music. Good for any age. Explore.org has links to lots of wildlife cameras. It’s pretty cool that you can see African wildlife, ospreys in Maine, or pandas in China any time you want. I think it’s time for a progress report. But first, how about some mental anguish? 😉 As I was procrastinating and freaking out about this project, I had a breakthrough that now seems completely obvious (funny how that happens sometimes). I expect to create the perfect suit. Despite the fact that I rarely allow myself to be a perfectionist in my sewing, despite the fact that I understand that skills take time to build and ‘finished is better than perfectly unfinished’, I’m putting a perfectionist’s pressure on myself with this project. Of course I’m procrastinating and freaking out! That’s completely unrealistic! I may have made suits before, but it takes time (and considerably more practice) to become skillful. I guess it just goes to show that perfectionism can sneak up on anyone. Once I realized this, I decided it was time to chill out. So, I put on some surfing to distract me and psych me up to sew bathing suits and got going. Now we can talk progress. This is year three of attempting to create a bathing suit that I love. The last two years have (sadly) been fails. Year one was a pretty spectacular fail due to my not clueing in to some very awful print placement, forgetting to add in the necessary internal support, and the fact that it came out too big. That suit just got cut up to become bottoms. 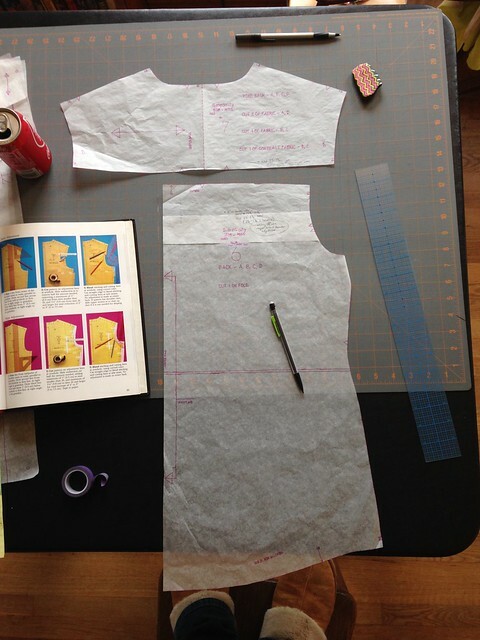 In year two I made every iteration of the Soma Swimsuit by Papercut Patterns. 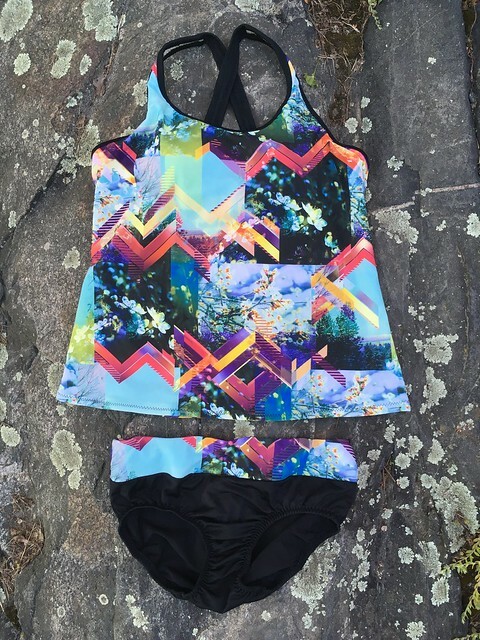 I wanted to practice and then hopefully create a tankini by hacking my favorite bikini view. Unfortunately, I have no practice constructing bras, so I couldn’t create the desired support well. I wore the tankini once, but by the end of the day, the structural elements started to come out of their places, so…no good. I also decided I wanted bottoms that offered fuller coverage. So here we are at year three. 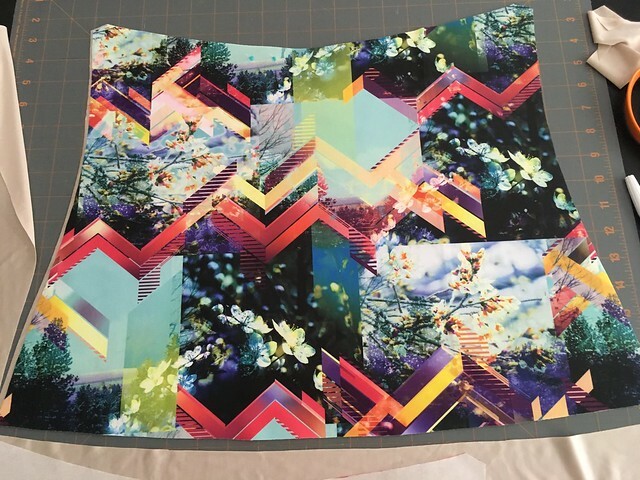 I finally found a fabric that I completely love at the Fabric Fairy (she has a lot of excellent swimsuit prints), but I can’t find a tankini pattern that I’m really excited about. I’m using the bottoms of the Jalie tankini (#3023), but I’m not jazzed about the top. It’s good, but I wanted something a little different. 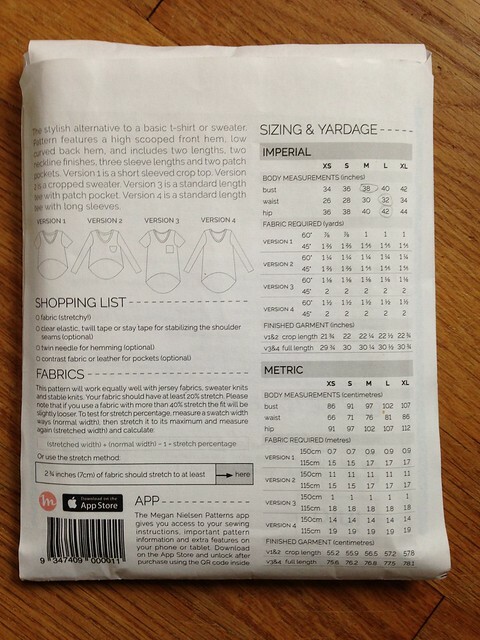 So my solution (which I realize may lead me to another fail) is to use lisette/Butterick 6295, a work-out top that I really like, and to add extra elastic to the neck and arms. 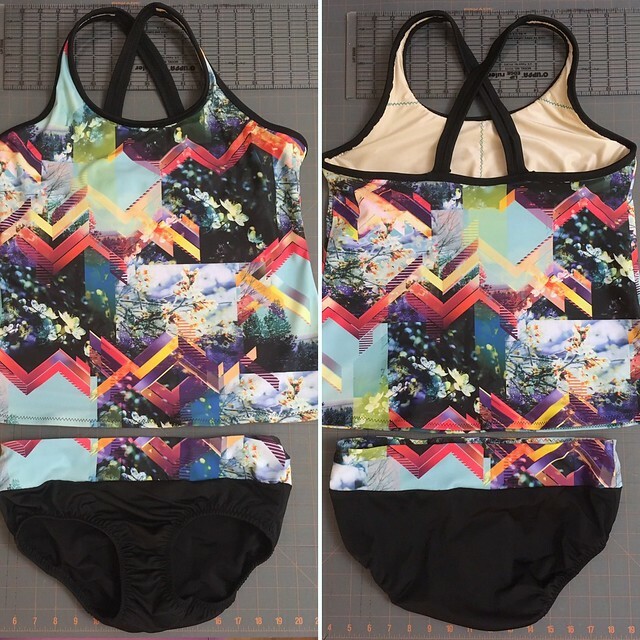 I want a pattern designer to create a tankini pattern that has interesting details to set it apart from the crowd, offers full bottom coverage and the option for internal support up top (in the form of underwires). I think you could (please!) also include a sports bra pattern as another view with the same optional underwire support and cool details. That would make me so happy. Jalie? Fehr Trade? Closet Case Files? Someone? Please? Until then, I’m working away at this as well as several bathing suit experiments that will not be for me. After this, I just want to make something easy for myself. 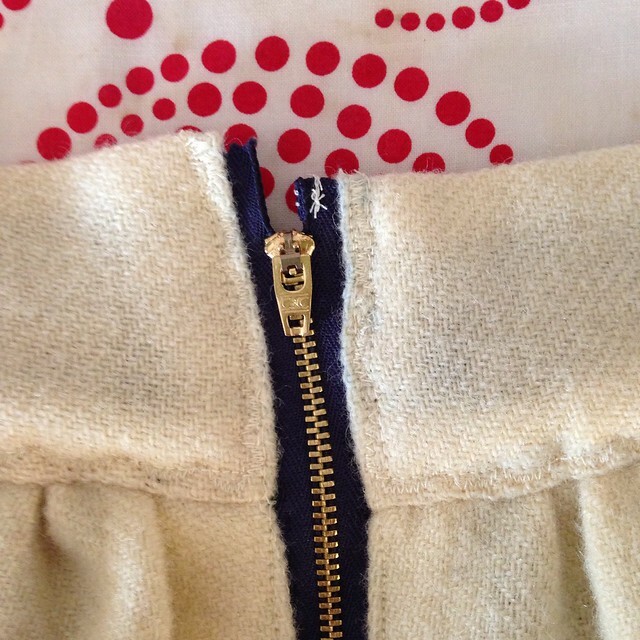 I want to return to my selfish, simple, sewing ways. Well…until I find the next exciting challenge. I’ve mentioned how much I like the podcast Thread Cult and I’ve also mentioned the 3-D printing company Nervous System. Guess what? 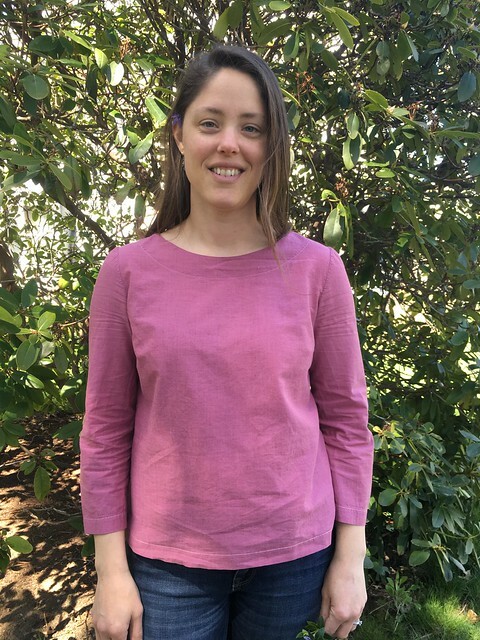 In episode #40, Christine interviews one of the founders of Nervous System about 3-D printed clothing, and it is FASCINATING. The dress Nervous System made is a thing of beauty (and wonder!). It’s been so much fun to discover new artists via Instagram. One of my current favorites is Anisa Makhoul (@anisamakhoul on Instagram). I love her saturated colors and cool style. Watching surfing movies has helped me make it through the last few winters, but now it’s bleeding into other parts of life as well. I’ve decided it’s my new figure skating–fun to watch when doing projects (as I mentioned above–good for when you are sewing bathing suits!). If you want to start down the surfing rabbit hole, let me enable you. The World Surf League app, which is free, lets you watch surfing live when events are on (or you can go to their website). I follow them on Instagram (@wsl) so I always know when an event is happening. My favorite is when I can watch the women surf. I have to dedicate this video to my husband’s family. I think they played this song a lot when he was growing up, but I doubt they did it like this. Ginger Jeans Dreams Realized! 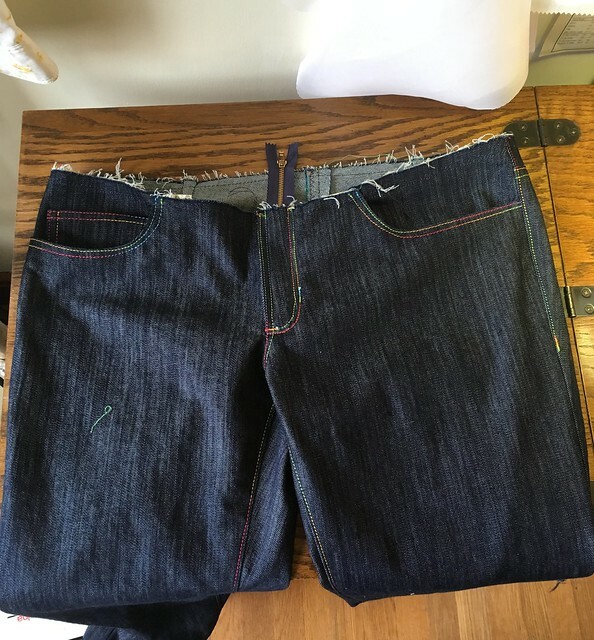 Or…I Made Jeans!!! I didn’t think it could be done. Could I ever make jeans? I doubted myself and procrastinated for ages. 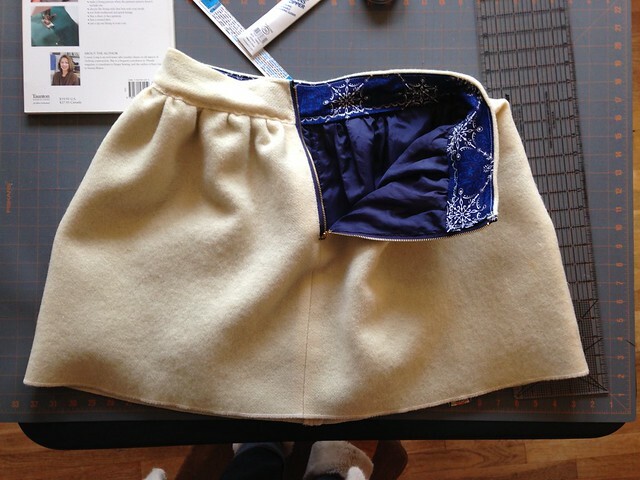 Until finally, I used my old sewing trick that has served me so well: just do the first step. This is great for life outside of sewing as well, but I mainly use it to get myself moving on “scary” projects. Even if the first step only takes one minute, once I do it, I can be done for that day. Next time, take the next step. Eventually I tend to get caught up in the process and things move along. That’s what happened with these jeans. 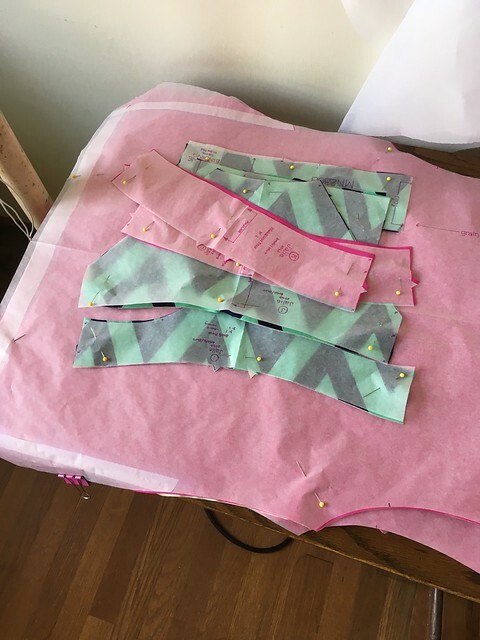 It took me forever to trace the pattern, and forever to cut them, and forever to get to sewing them, but at the point of sewing, I took the first step…and then the second…and then worked on them for a whole day! By that point, things were getting exciting, and I couldn’t wait to work on them again. After another day of sewing, I had them done! They are the most comfortable jeans I think I have ever worn. And they fit! Aside from jeans-making being new to me (and therefore intimidating), pants in general intimidate me in the area of fit. The few times I have made/attempted to make pants or shorts, I can tell something is off, but I don’t know how to fix it. There were two things, I think, that really saved this pants attempt. One was that the drafting on these is different from what I have encountered in the Big 4 patterns that I have tried. In those, I always feel like the front is too high and the back is too low. 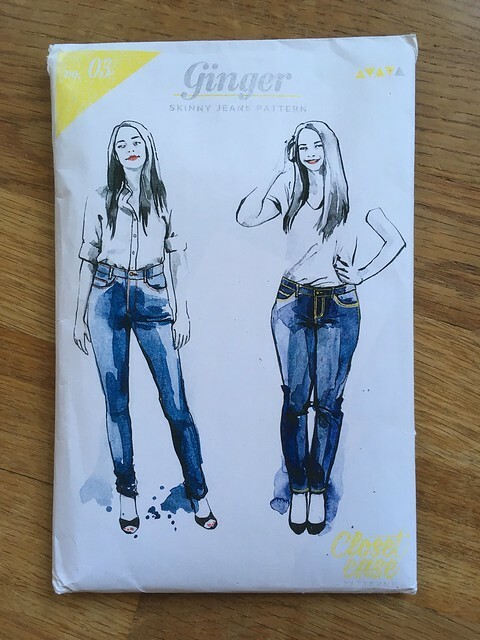 This jeans pattern didn’t feel that way at all. 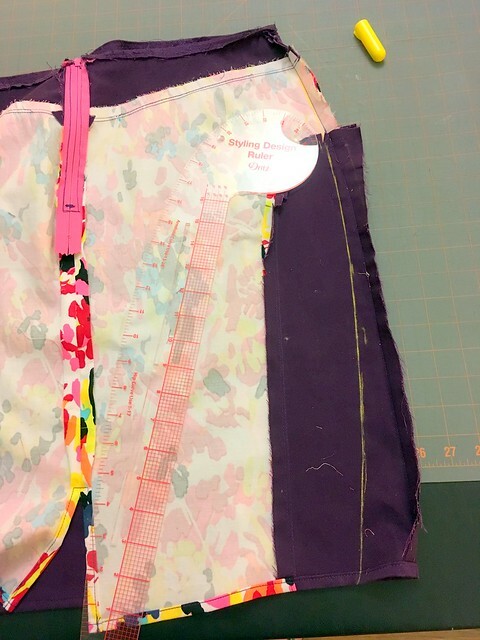 The second thing that saved this project was all the excellent fitting advice that Heather (the designer) offers both in the instructions and in the sew-along on her blog, Closet Case Files. So, let’s talk process a bit (Technical Talk Ensuing. Skim this part if you just want pictures.). 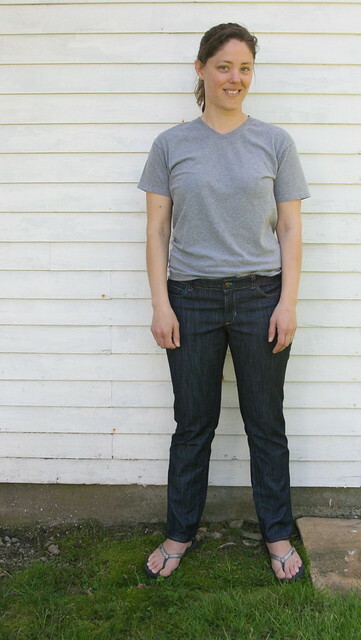 I chose to make this first pair of jeans out of an inexpensive denim in case I had a lot of problems. I got my denim at Jo-Ann Fabrics on sale. 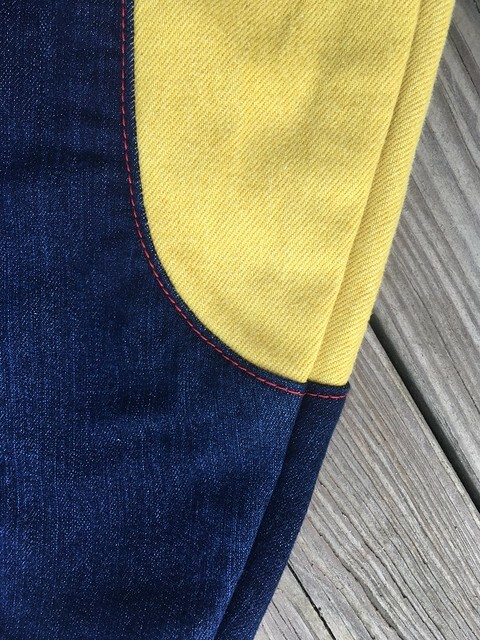 I noticed that many others had used denim from Jo-Ann’s with success, and so I decided to give it a try. 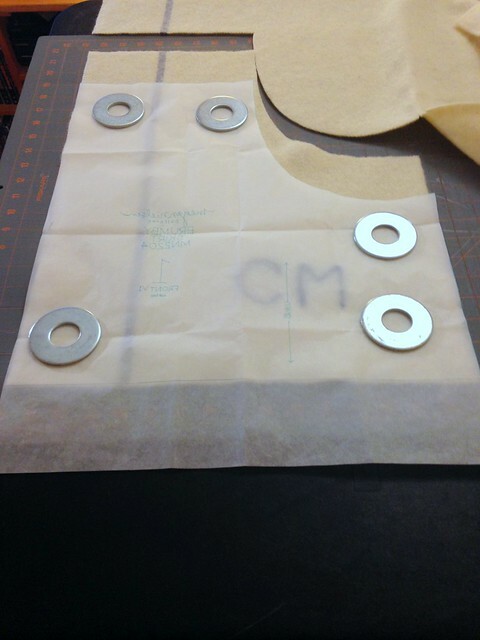 I also got some interfacing there. I found some rainbow topstitching thread in my stash. (I wish I knew where it came from so I could get more, but I have no idea. 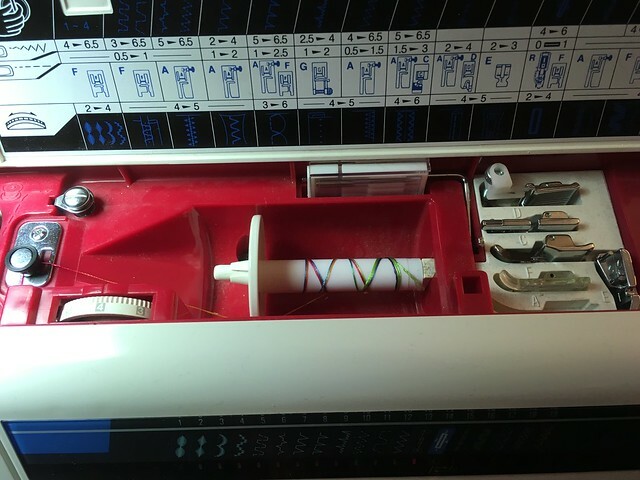 It may not even be real topstitching thread.) 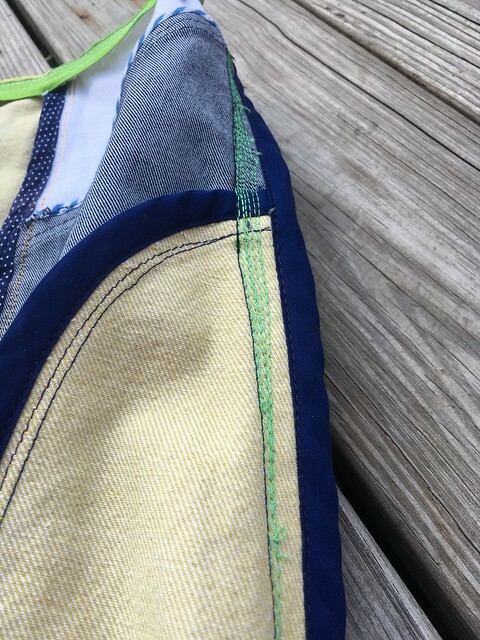 I used navy thread from my stash for the non-topstitching parts, and some really old thread for the basting. I’ve decided that basting is an excellent use for old thread. I have lots of hand-me-down thread and I know you’re not *supposed* to use it, but I do. I can’t let it go to waste. Basting seems the perfect use, because if it breaks, it doesn’t really matter. The fabric for my pockets is some very old Amy Butler fabric that I had in my stash. My husband saw it and said, “Oh! You’re making your pockets out of diaper bag!” Back when I had my first baby, one of my best friends made me a diaper bag with this fabric. Time to put the scraps to a new use! Now on to the jeans. I made View A in a size 14. View A has a low rise with stovepipe legs–similar to what I wear on a daily basis. 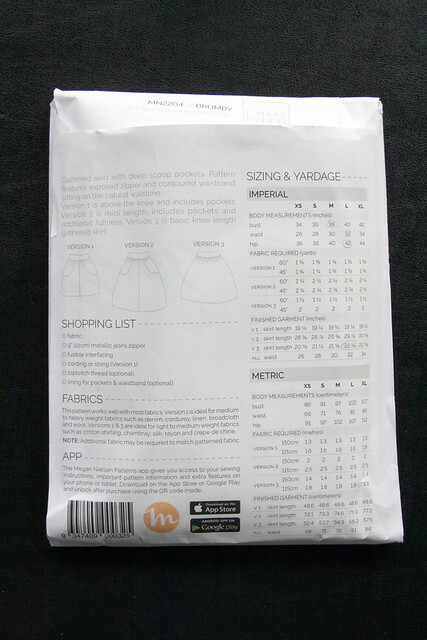 Because I’m new to fitting pants, I just cut the size that fit my measurements without any initial adjustments. I assembled the front of the pants completely. 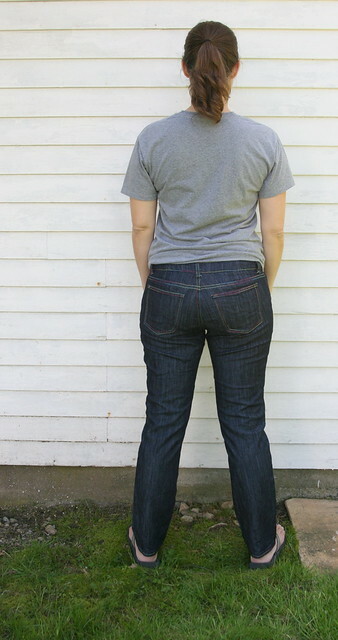 Then I basted the back of the pants with the exception of the pockets, which I pinned on. After that I basted the sides together, all before assembling the waistband. My main issue came at the back. 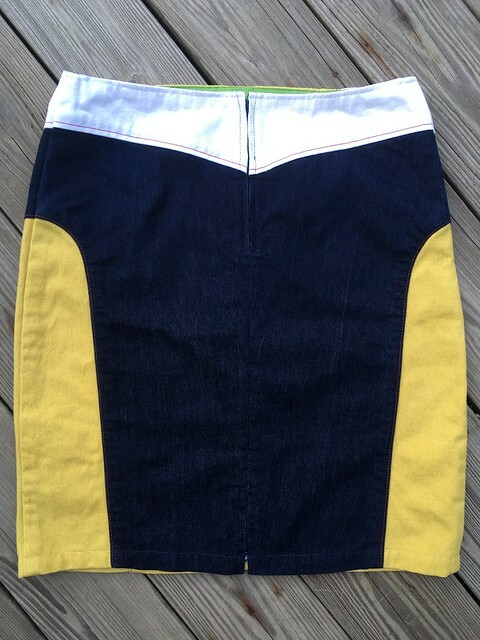 The back waist gaped. Heather explained very clearly what I needed to do, and so I made a few darts in the yoke, tried the pants on again, and then took out just a bit more until they felt right. Then I sewed everything minus the waistband together. After that, I assembled the waistband and basted it on. It also gaped, so I followed Heather’s directions and put a few darts in. On my first try, I sewed the darts in opposite to how they were supposed to go! Argh!! I contemplated just recutting the whole thing, but I ripped out the darts and resewed them in the end. Once I got that right, I sewed it all up and went after the back pockets. I started to get nervous when I sewed them on because I was nearly out of topstitching thread. I managed to finish the pockets with just a little bit left. Success! When I put these pants on for the first time…oh, it was wonderful! They were so comfortable and fit so well. I had done it thanks to help from Heather Lou! 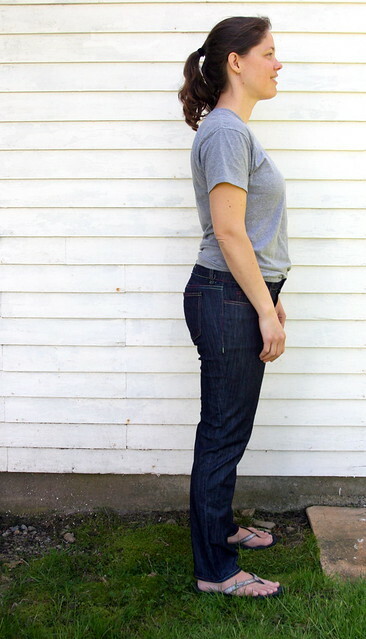 What an amazing thing to make your own jeans! If and when I make these again, here is what I would do differently. 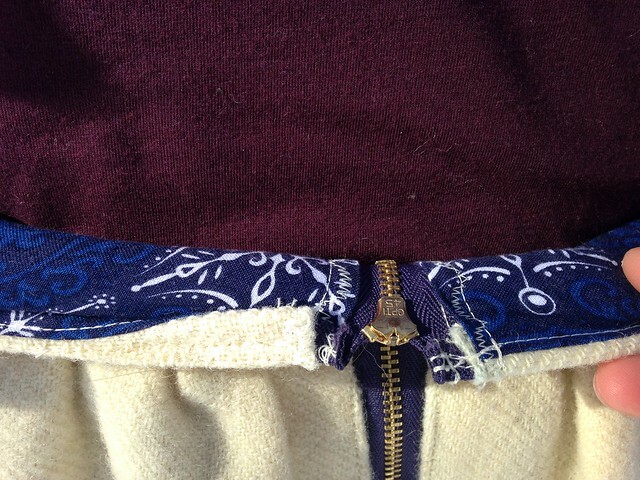 I would interface the waistband. I thought I wanted one that would stretch but, I think because I chose a cheaper denim, mine tends to stretch out. I would also consider basting the jeans the slightest bit tighter. 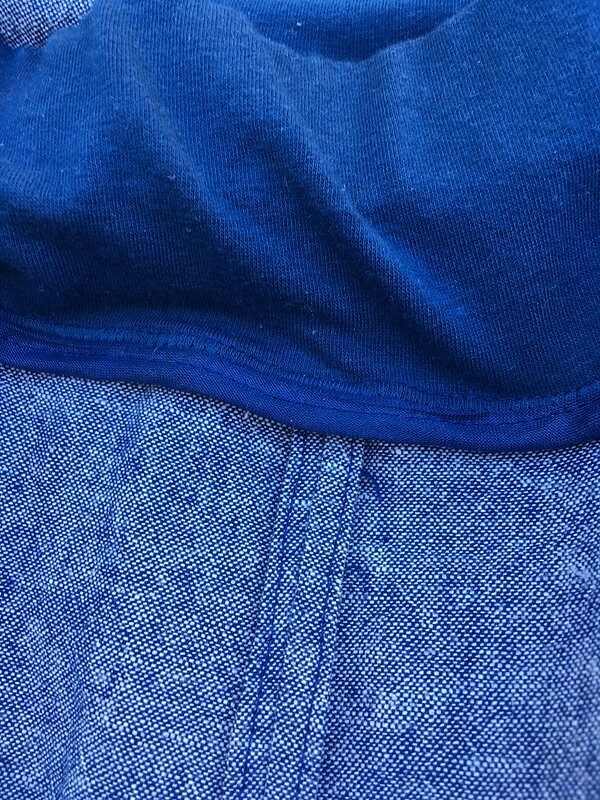 These are so comfortable, but the denim doesn’t have the greatest recovery despite the spandex content. 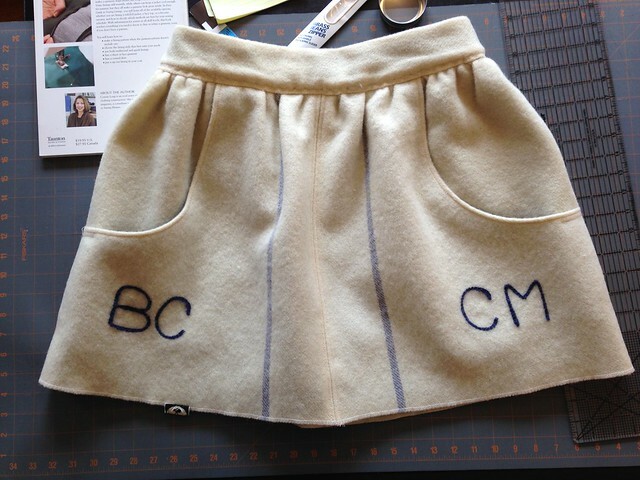 Lastly, I’m curious about how to do a midrise version, something Heather explains on her blog. I’d like to try that. 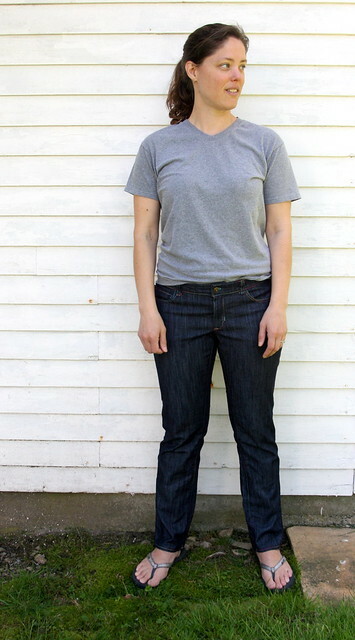 If you are considering making jeans, I highly recommend this pattern. 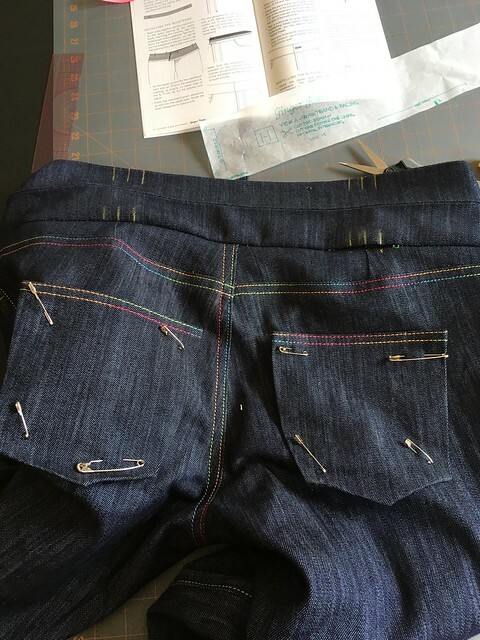 It gave me enough confidence to move forward and to want to try making more pants so I can learn how to fit other styles to my body as well. 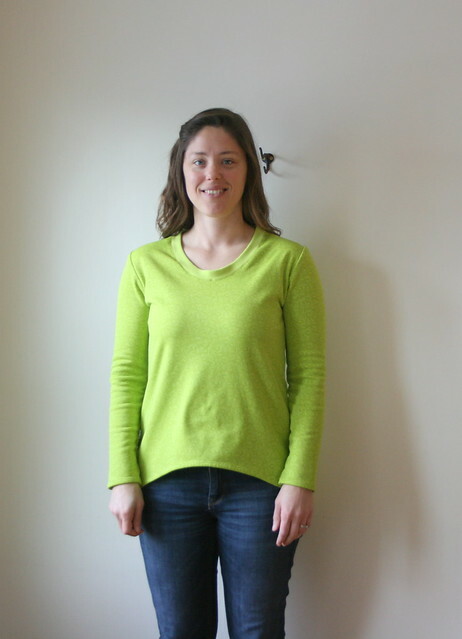 Heather also has a jeans making e-book and published a blog post on basic pants fitting that you might find helpful. 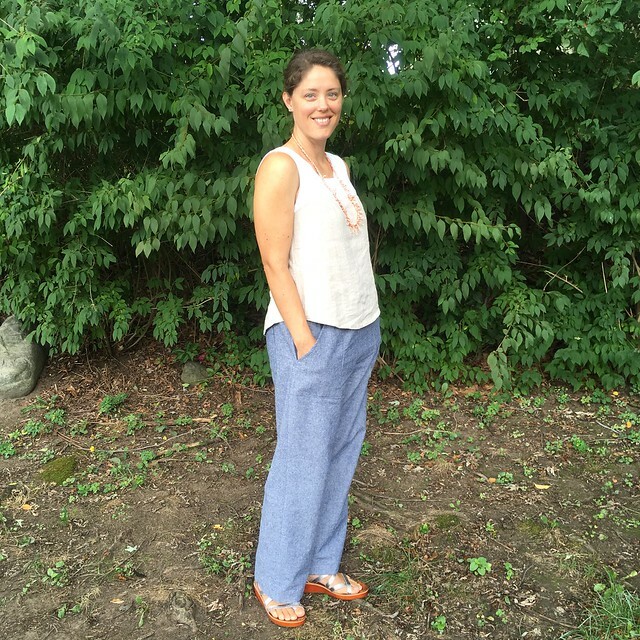 Update: I’m linking this post up with Allie J.’s blog for her series called “The Social Sew”. Each month she puts out a sewing theme and you can link up your recent projects that fit within the theme. 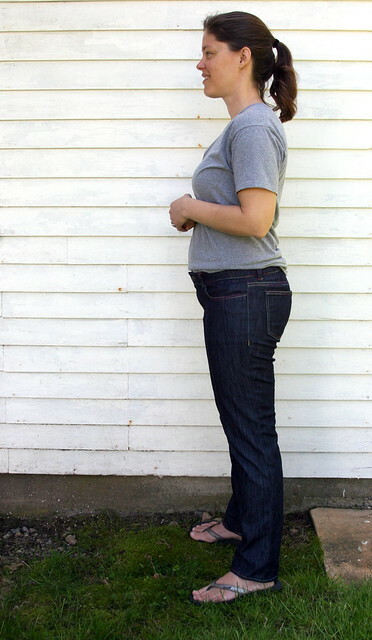 Since this month is ‘Me Made Basics‘, I thought these jeans would be a great fit. You can also check out what everyone else has made. It’s a great way to find new sewing blogs! I just found out that one of my favorite podcasts, Thread Cult, is back up and running. I thought perhaps it had been abandoned, but it turns out it was only on hiatus. 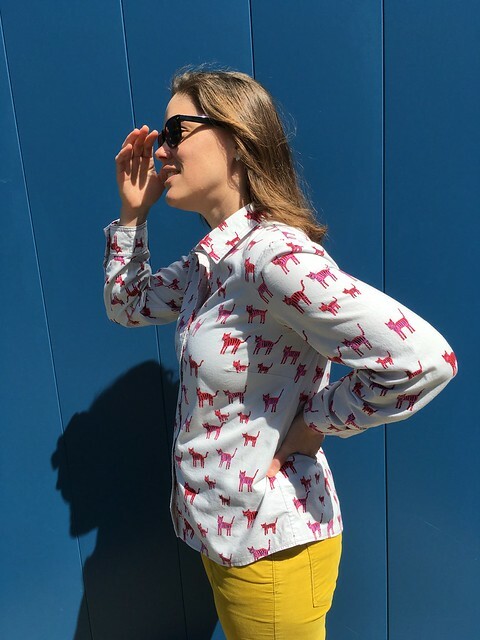 This podcast is “for the sewing, fashion and textile obsessed”. I’m fascinated by the Instagram account of Tara Curtis @t_jaye. She makes these fabulous geometric designs that remind me of quilts, but she does it by weaving strips of fabric. If you love pattern and design, I think you’ll like her work. She also has a website. Have you ever looked at Cooking Light magazine? I like their recipes because they are healthy AND they taste good! Several of their recipes have become family favorites. You may be able to read Cooking Light at your library (ours lends out magazines) or check out their recipes via their website. How are you? I hope, if you are in the Northern Hemisphere, that spring has arrived. Spring is trying to happen here, but it’s still a little cold. Despite that, I’ve got warmer days on my mind, and after some complicated projects just finished and several other tricky ones in progress, I needed a simple, fast, and summery pattern. I found just the right thing in Lotta Jansdotter’s new book Everyday Style. It seemed like just the right thing to go with the lovely pink voile I got at Pintuck & Purl when they opened. 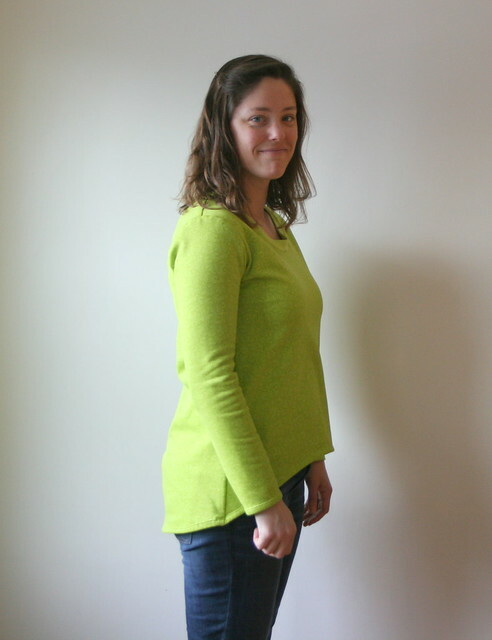 I made Variation 2 with the three-quarter length sleeves in a size large. My only regret (and I find it equally annoying and funny that I did this) is that I didn’t measure the back pattern piece to see if it would need a broad-back adjustment. 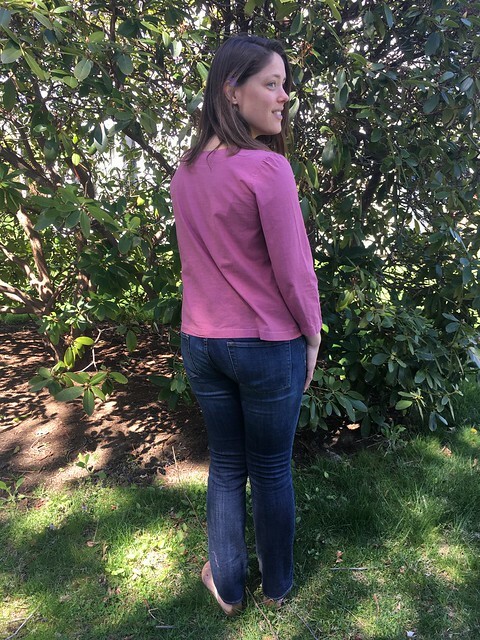 The shirt turned out to be quite comfortable, but if I had checked ahead of time, I would have done a broad-back adjustment and it would have been even more comfortable. After all my recent blog posts about broad-back adjustments (here and here), I didn’t even check. Ironically enough, I did check the dart height, and that turned out to be fine. Thankfully, there is good ease in this pattern, and it’s still wearable. Living in New England where the weather changes several times throughout the day, I’m looking forward to having this for summer when a breeze springs up or the air gets cooler in the evening. 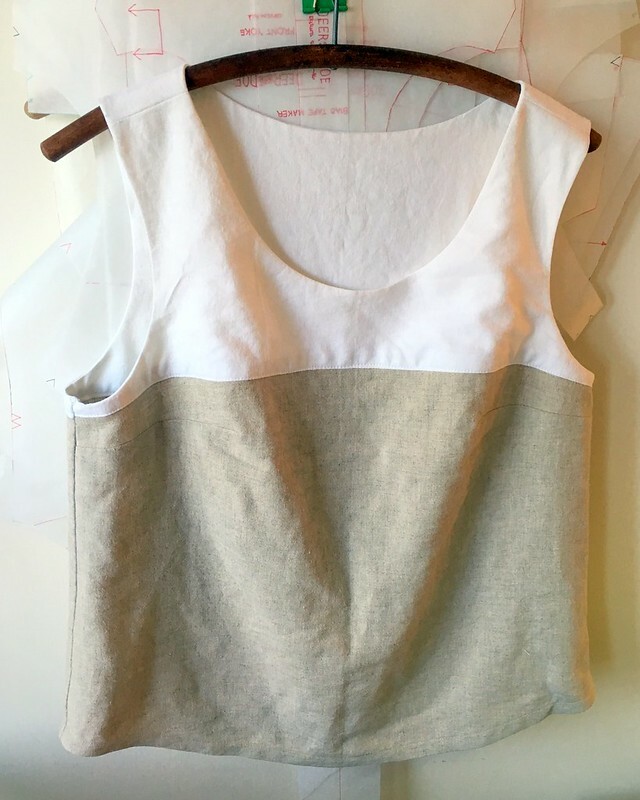 The Esme top gets my stamp of approval as a quick and simple make, especially since there are numerous variations if you want to change things up a bit. I decided that this year I wasn’t going to worry about daily photos, so I won’t be doing weekly outfit round-ups on the blog. You may see a few photos if you follow me on Instagram, but my focus for this year is the challenge itself. The only downside so far is that I might forget what I wore earlier in the week without the photos to remind me! 😉 Check out Zoe’s blog for more information on this year’s Me-Made-May. OK, my friends! It’s nearly time for one of my FAVORITE events of the year: BRIMFIELD ANTIQUE SHOW! Brimfield is the largest outdoor antique show/market in the US. It takes place three times a year in the town of Brimfield, MA and people come from all over the country (and the world) to shop for antiques, upcycled antiques, and unique materials for creating. This year, for the very first time, I know one of the vendors! My friend Laurel, of Retromat Vintage is going to be at Booth 22 of New England Motel, which is one of my favorite fields. She sells great vintage items. I’m always really impressed by her clothing, but she has much more than that. If you go to Brimfield, stop by and show her some love. Have you ever tried a magnetic pincushion? After buying more pins awhile ago, my little pin jar was full and hard to use, so I bought a Zirkel magnetic pincushion at Pintuck & Purl. I missed the main selling point until I got home and started using it. If you drop your pins in the middle of the square magnet, it fans them out around the edges in a circular pattern. It’s so cool and fun to use! I knew I would like it, but I had no idea I would like it this much. Here’s a link to a 14 second video that shows how it works. I’ve mentioned them before, but I think it’s time to officially recommend to you The Curvy Sewing Collective. This is a great site for so many things! I find myself returning to it frequently to read their helpful tutorials, pattern reviews, and to look at the great projects from their contributors. This site also gets two thumbs up for body positivity. We can all use that! I’m so excited to share my latest project with you today. I LOVE this shirt. There are two reasons I love it so much. 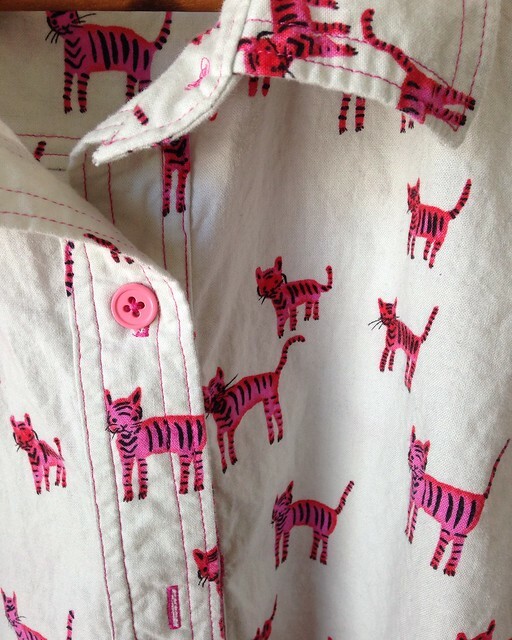 The first is this awesome Cotton + Steel pink tiger fabric. The second is the fit! Ping of Peneloping was my inspiration for this project. Her tiger shirt is amazing (as is everything she makes), and it set me on the quest for my own tiger shirt. You may remember my first attempt at this pattern, made from a vintage sheet. I really loved that shirt. It was beautiful, except for being too tight across the back. I also realized, in trying it on before making this one, that the darts were slightly too high. Luckily, I had just learned both how to do a broad back adjustment AND how to lower darts. 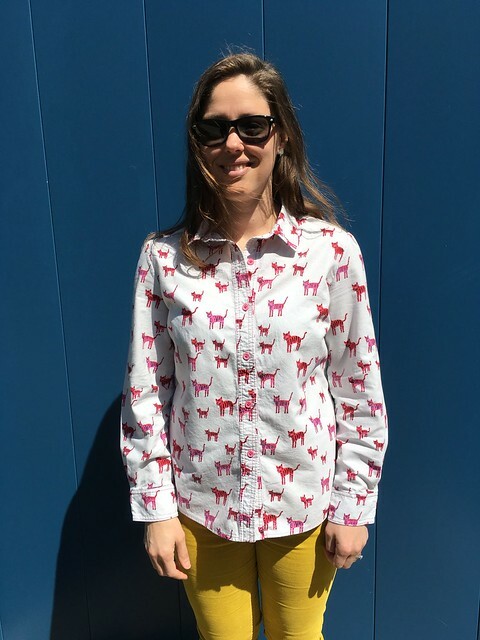 After doing both of these things to this pattern, I think I may have found my perfect casual button-down…and I have worn it a billion times since making it. I’m actually afraid of wearing it out. This post is going to get a bit technical in the hopes that it might help someone else out there. I won’t go into lowering a bust dart because The Curvy Sewing Collective blog just did an excellent post on this. You can find that here. I will, however, show you pictures of the major broad back adjustment I did in case anyone else is working on learning how to do this. 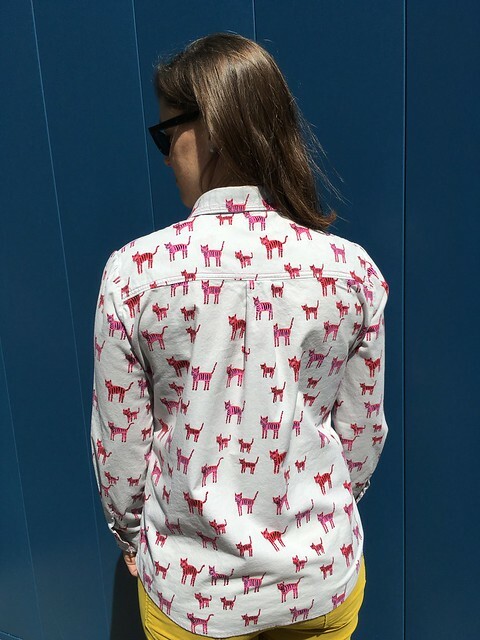 I showed how I did this on a princess-seam shirt in this post. 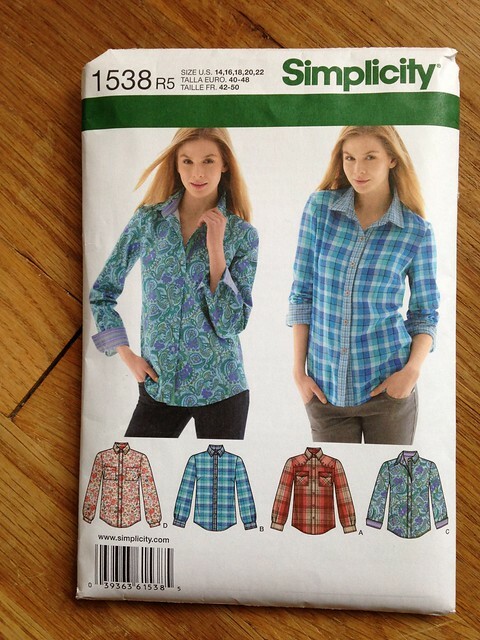 Today’s shirt, Simplicity 1538 does not have princess seams, but does have a yoke in the back. Now is the time to skim if you don’t care about the technical aspects of this project. 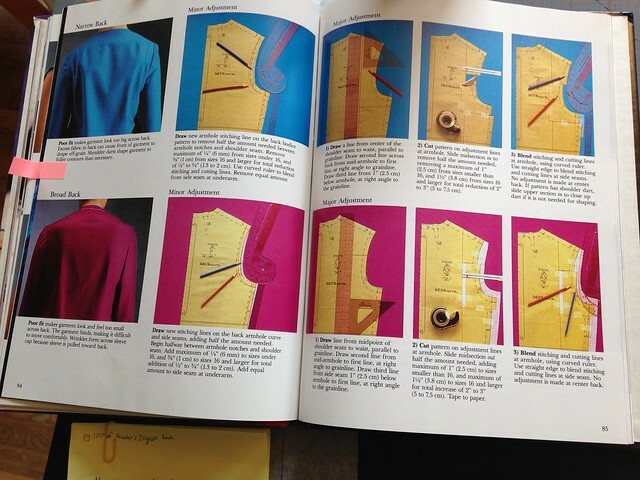 As before, I used the information in The Perfect Fit, part of The Singer Sewing Reference Library. 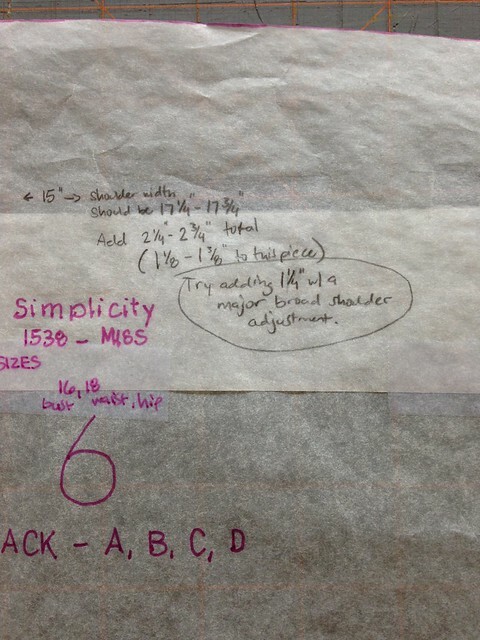 Because I knew my back measurement, I could measure the pattern to see how much width + ease I needed to make the shirt comfortable when sewn up. The pattern was 15 inches across the back. I needed 17 1/4-17 3/4 inches in order for this to be comfortable on me. (I mention how I measured for this in this post.) This meant I had to add 1 1/8-1 3/8 inches to this pattern piece (since it only represents half of the back). 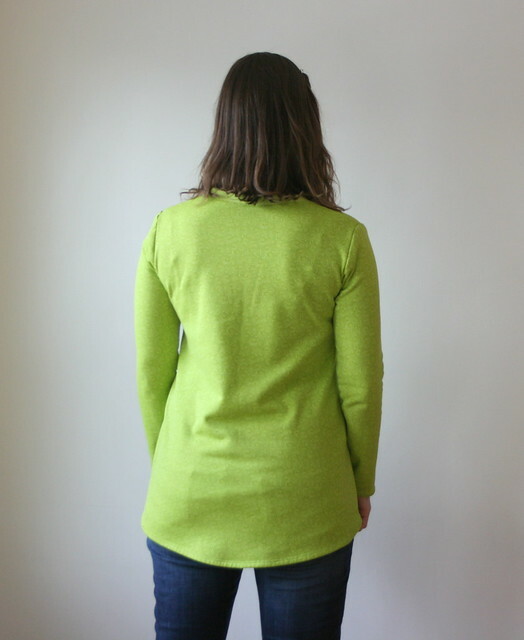 I decided I would try adding 1 1/4 inches with a major broad back adjustment (rather than a minor adjustment, which just adds a little width to the back armhole curve). I have a full yoke piece and a half bottom back piece. I folded the yoke in half so that the edges of each side could be adjusted simultaneously (and hopefully identically). You’ll see that my yoke is narrower than the back bottom piece. That’s because there is a little bit of gathering below the yoke on the center back. As the shirt is sewn, they become the same width. For the major adjustment, I taped the yoke to the bottom piece of the back so I could work on them as one. I made sure to overlap them by 5/8 inch to account for seam allowance. Next I drew two horizontal lines perpendicular to the one I had just drawn. Line number one went from the middle of the armhole over to my first (vertical) line and line number two went from about 1 inch below the armhole to my vertical line. Since line number one coincided with where the yoke joins, you can’t see it, but I’m pointing to the two new lines with my fingers in the picture below. That little ‘almost rectangle’ you have is what you will slide out the amount you need for that half of your shirt (so, it’s half the total amount you need across your back). In my case, I slid that piece over 1 1/4 inches. 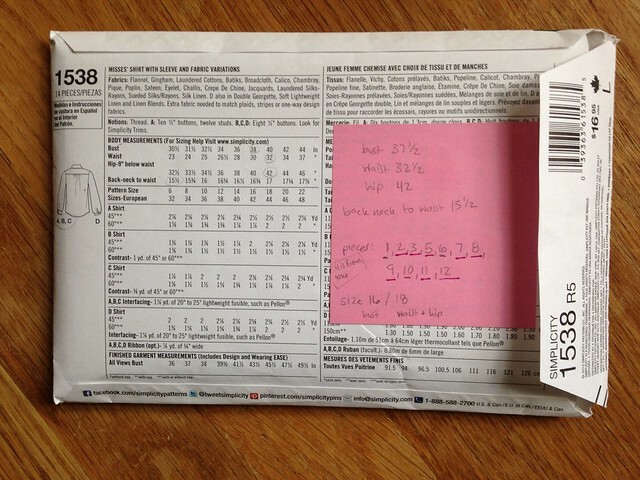 The book notes that the maximum you should slide it out for sizes smaller than 16 is 1 inch. For 16 and up, you can slide it a maximum of 1 1/2 inches. 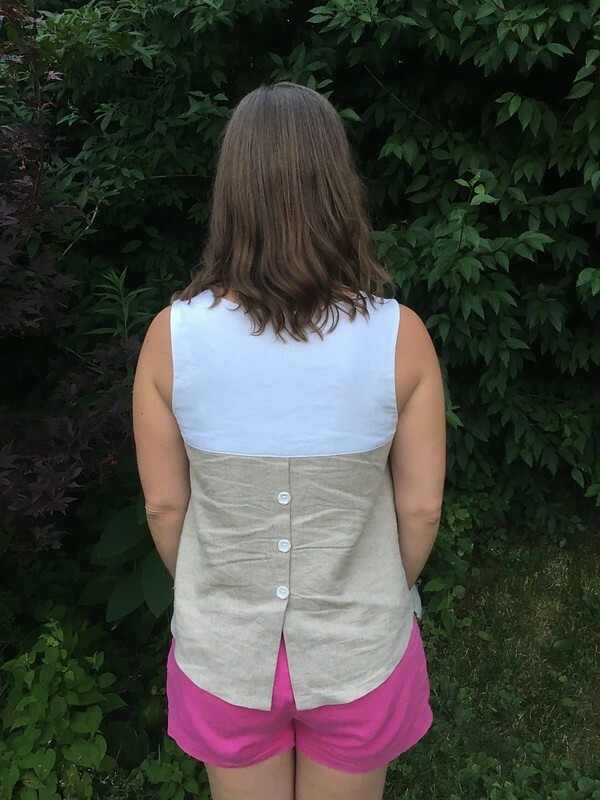 Since I had cut a 16 at the bust and an 18 at the waist and hips, this worked for me, and would give me a total amount of 2 1/2 inches across my whole back when the shirt was cut out. Once you slide that piece out the amount you need, place some paper beneath it and tape it down. 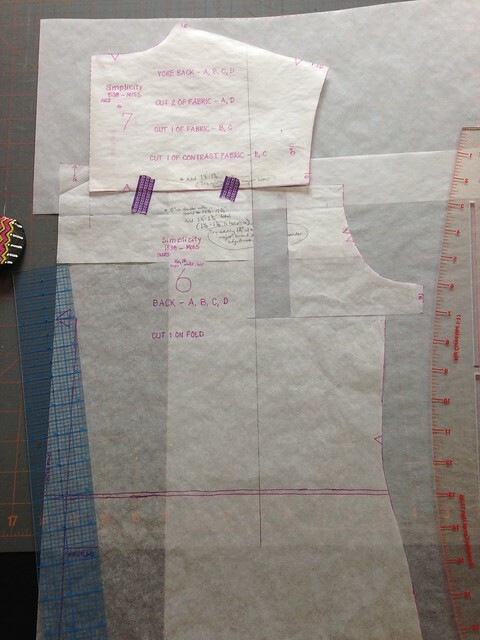 It helps if the paper extends out beyond the edges of your pattern by the armhole and side seam since you will have to redraw those areas now. I found this part kind of tricky. I felt like I was making it up as I went along, but here is what I did. 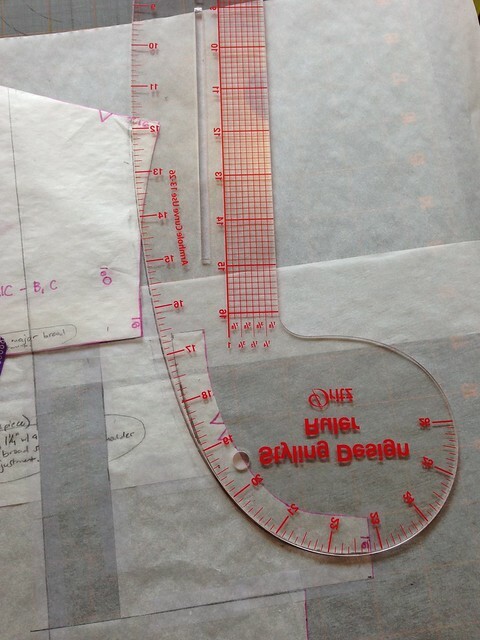 I used my curved ruler to redraw the seamline itself, and then I added my seam allowance in afterward. I just sort of slid the ruler around until it seemed right. 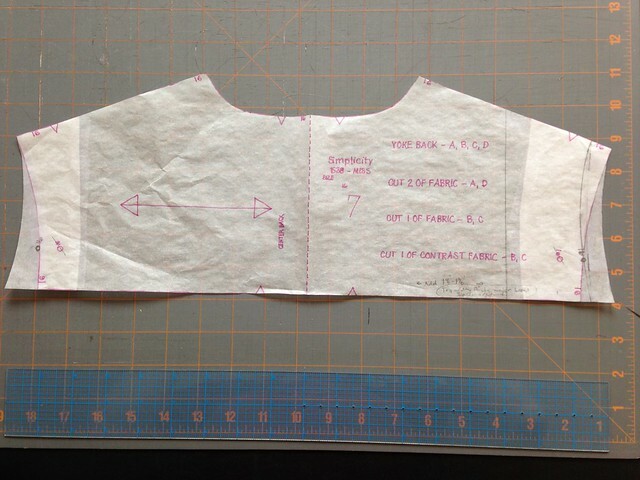 I also had to redraw the area below the armhole, blending the armhole into the side seam. Again, I felt like I didn’t know what I was doing, so I took my best guess. Then I cut out my altered pattern pieces (back bottom and yoke). Because my yoke piece was actually a full piece that I had folded in half to do my alterations on, I had to make sure that I had the correct and identical alterations on both edges. 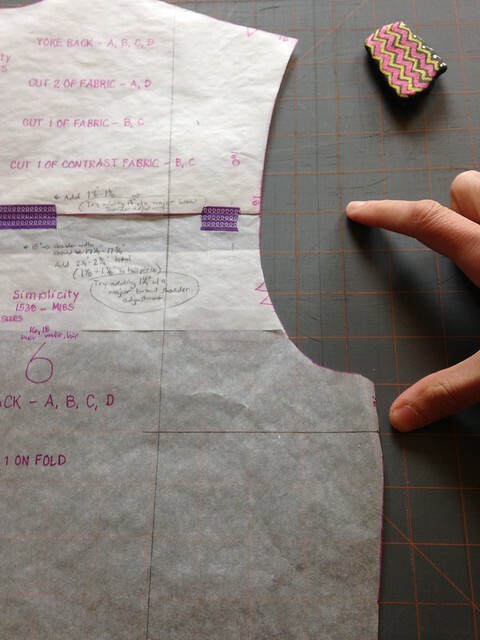 Don’t forget to move any markings (like notches and dots) to an equivalent place on your altered pattern pieces. 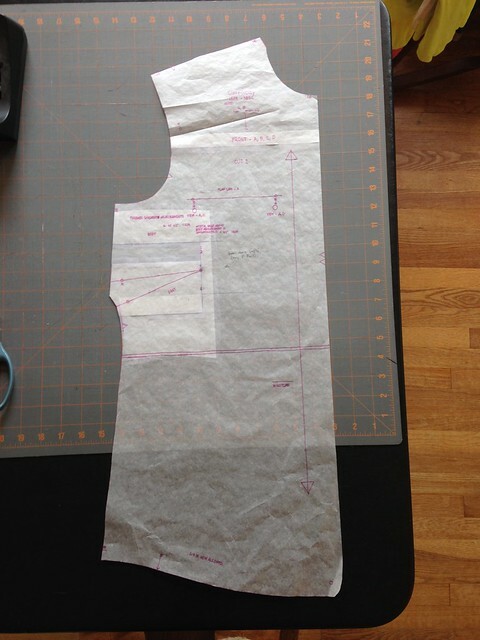 A really great thing about this alteration is that it doesn’t change the length of the shoulder seam. If it did, I would have to adjust the front shoulder seam as well. The length of that seamline wasn’t my problem, and neither was the size I had chosen. 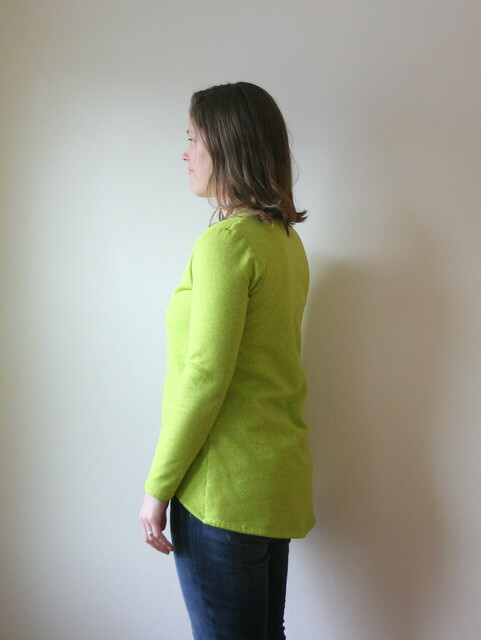 The width of the shoulders in the back was the issue (and one I also have with store-bought clothing in woven fabrics). This alteration completely fixed that, and now the shirt is wonderfully comfortable across my shoulders. The other thing that I did was to lower the front dart by an inch. I found my information for how to do that in The Perfect Fit as well. 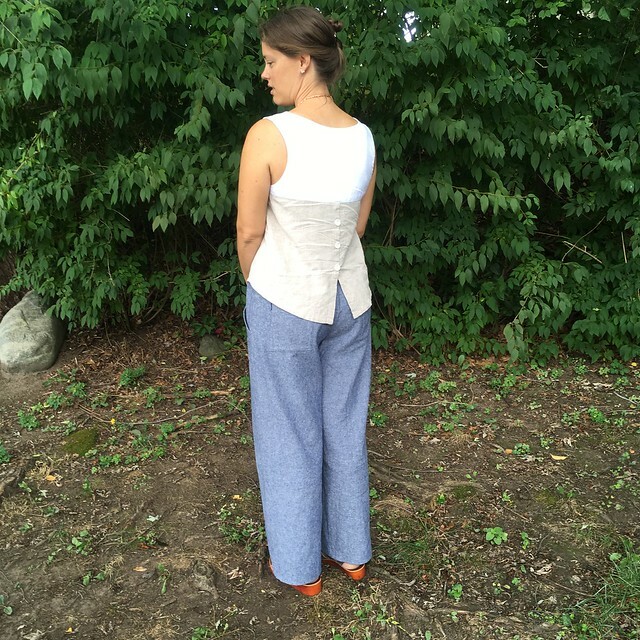 As I mentioned above, The Curvy Sewing Collective did a great tutorial on this very thing. If you find that dart height is an issue for you, you should check out that post. Even thought I’m not going into the details, I will show you how my front pattern piece looked after I moved the dart down. I’m glad I didn’t go any lower, and I was a little nervous that the inch had been too much, but after wearing the shirt often, I think it turned out great. Technical details now finished. Time for pretty pictures!!! We found the best background for these shots, and it was actually sunny, too. All that color + sunshine makes me happy. And one little fabric and topstitching close-up. Love those tigers! Wow! That was the most technical post I’ve written in a long time (or ever?). How about some fun? I’ve got another podcast for you! Now that I’m out of school, I’m discovering that history is interesting. 😉 I can see how valuable it is to know the past because then you understand why things are the way they are today and how you can avoid the mistakes of the past (hopefully). It’s also just interesting. I have long loved “Stuff You Missed in History Class”, but now I have to add “The History of English Podcast” to my list as well. I realized I was really into it when I went back to episode one and started binge-listening. It’s not about technical things like grammar, but more a broad history lesson about how languages are related and how the English of today came to be. Have you heard about Me Made May? If you are a seamstress/stitcher/sewist you should check it out. It’s a personal pledge to wear your handmades throughout May. You can challenge yourself to wear one for the month, one every day, or all handmade all month. It’s whatever you choose. I participated last year and loved it, and I’m planning on doing it again this year. Years ago some amazing sewing ladies who are my mother’s friends, gave me a vintage wool blanket (among other things). They had a business repairing antique quilts, as well as upcycling quilts that couldn’t be repaired and turning them into handmade goods. When they moved on to other things, they gave me some of their fabric and thread. I didn’t sew much at the time, but being a creative person, they thought I might be able to use the things. 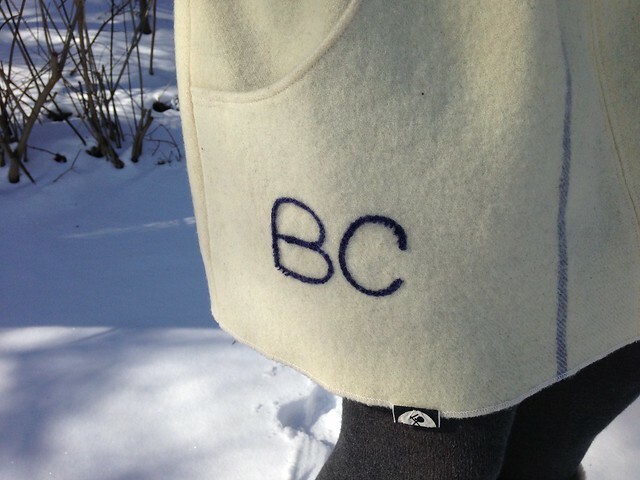 One of my favorite items was part of a woolen blanket with two sets of initials on it. 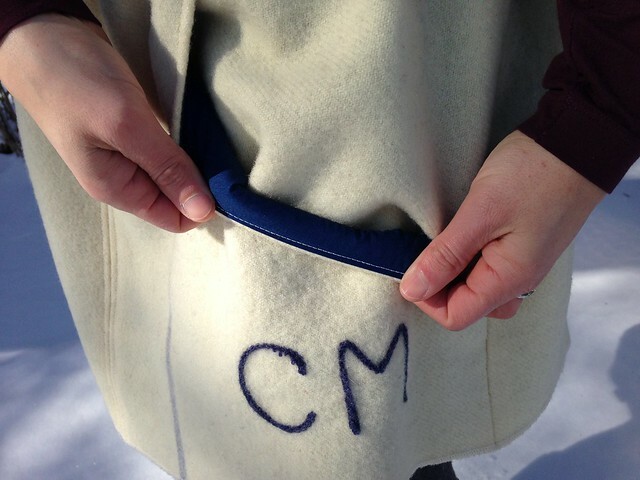 It was a winter white with two blue stripes and navy embroidery, and although I didn’t know its story, it seemed special. I put it aside until just the right project presented itself. 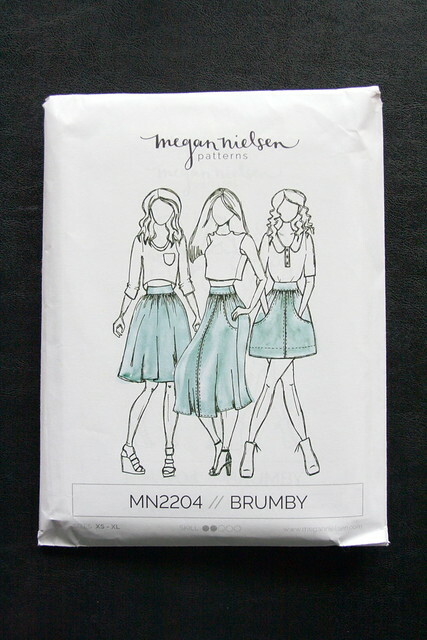 It finally seemed that I had found the perfect use for it when I saw the Brumby Skirt by Megan Nielsen. I knew it might not work…but I also knew it might. That idea, that sort of razor’s edge between working or not working is what makes creative endeavors so exciting. I love to try projects where I am more sure of the outcome. I get a lot of satisfaction from them, but it really gets interesting when you ask the question, “Will it work?” I think this is a question that some of the best art and the best fashion have at their heart. Sometimes the outcome is terrible. Sometimes it’s ok. But sometimes it goes beyond what you imagined. So, let’s get into some details. 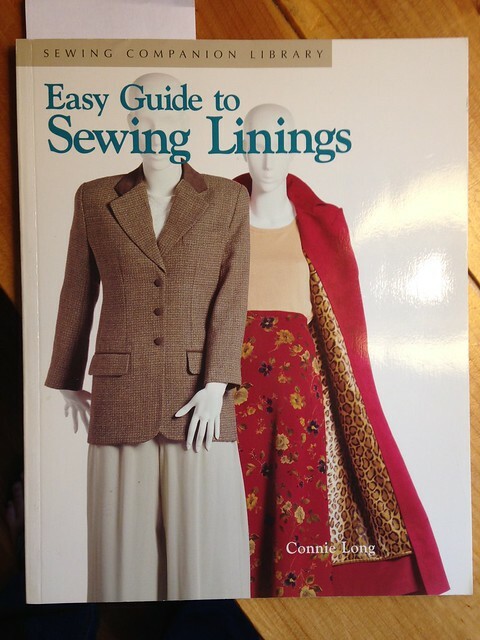 The skill that I hoped to learn in this project was how to create a lining, so I bought some Bemberg rayon lining from Joann’s and leaned heavily on the book Easy Guide to Sewing Linings by Connie Long. 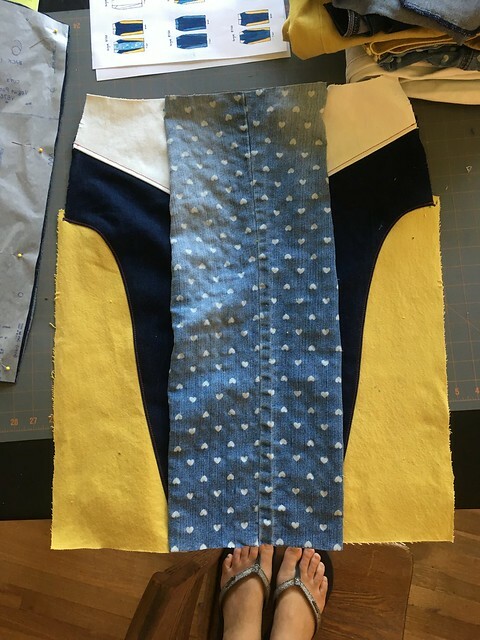 Maggie from Pintuck & Purl helped me think through my process for creating the waistband, which included lining it with some fabric from my stash and omitting the interfacing. 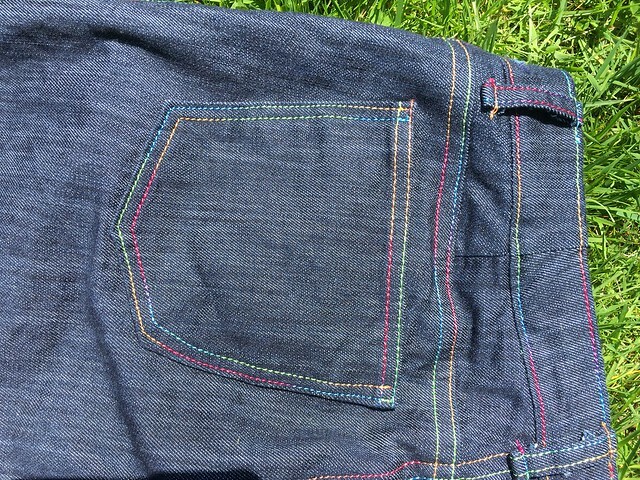 I found a plain navy fabric in my stash for the inside of the pockets. Since the edge of the blanket was already finished, I decided to omit the hem. This also saved me fabric, since I had a limited amount of blanket to work with. In order to do that, I marked the place I would have turned the fabric up to sew the hem and used that as the new bottom line for my skirt. You can see it faintly below. Like vintage fabric sometimes does, this blanket had some light stains. I tried using a stain remover to get them out, but it didn’t work, so I did my best to cut around the ones I could. The rest just had to remain. I did run into a little bit of trouble while sewing in the zipper. It wasn’t quite even at the top, but since this is for me, and I get to decide what I will and won’t fix, I just folded the extra over and sewed it down. Problem solved. I also decided to do a decorative topstitch above the seam that joins to waistband to the skirt, just to make sure everything was tacked down. I wanted this done before winter was over, so I was pretty motivated to get it finished. The days after I finished it were cold, so I could wear it right away! 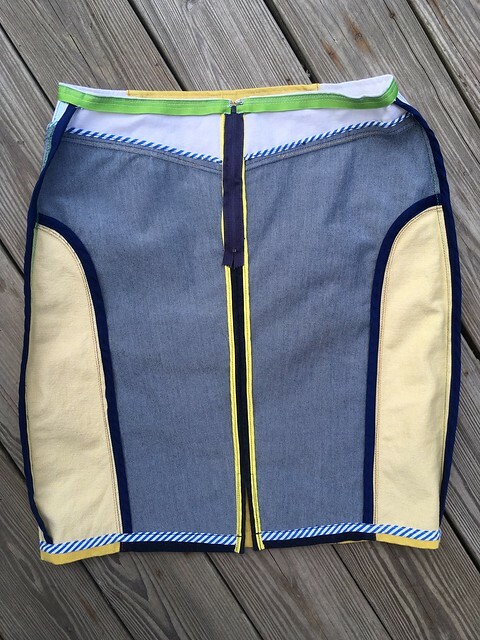 It’s really warm and comfortable and love all the different parts I incorporated–lining, colored pockets, and patterned waistband. I deem it a sewing success. 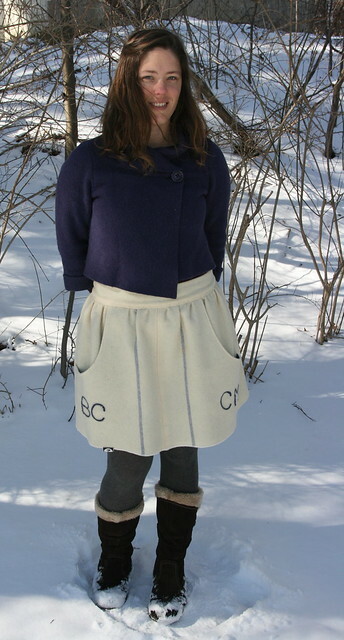 I haven’t yet had a chance to blog a few of my other winter projects, but as far as sewing things goes, this was my last winter make. I’m on to spring sewing. 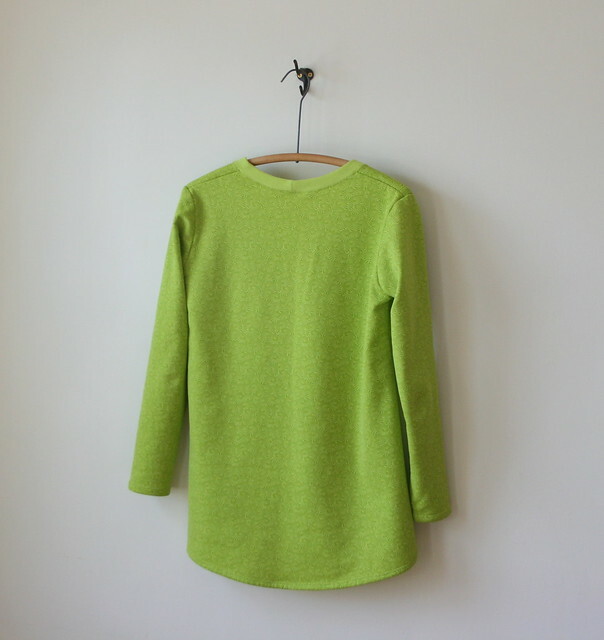 I’ll still post the few made-in-winter projects I haven’t shown you yet, but this is the only garment that will probably be worn exclusively in the winter, so I wanted to blog it before spring came. As I come to love hand-sewing more, I find my interest in embroidery being renewed and growing, too. In that vein, I’ve found some really fun embroidery artists. 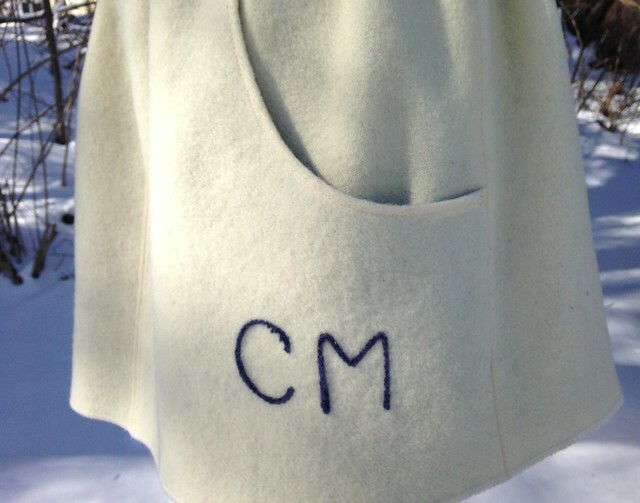 An etsy shop I recently discovered is cozyblue handmade. They have embroidery patterns, etc. I’m a fan of the Sea Captain. If you listen to podcasts, I’ve just found a new one that I like: The Seams podcast. It’s about clothing and the stories connected to it. 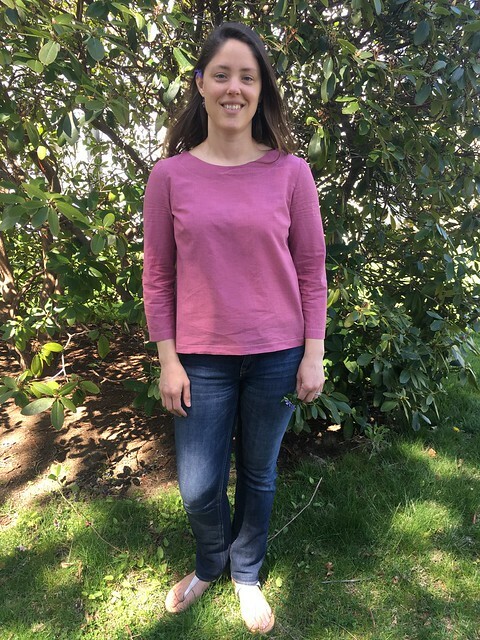 Jacki Lyden does a great job of interviewing a wide variety of people and looking at clothing from many angles. If you like to garden, but sometimes feel nervous because you don’t really know your plants’ intentions, you should watch “Indoor Gardening Tips from a Man Who’s Very Scared of Plants”. Problem: SOLVED! Today’s project is a second take on a shirt I’ve made once before. 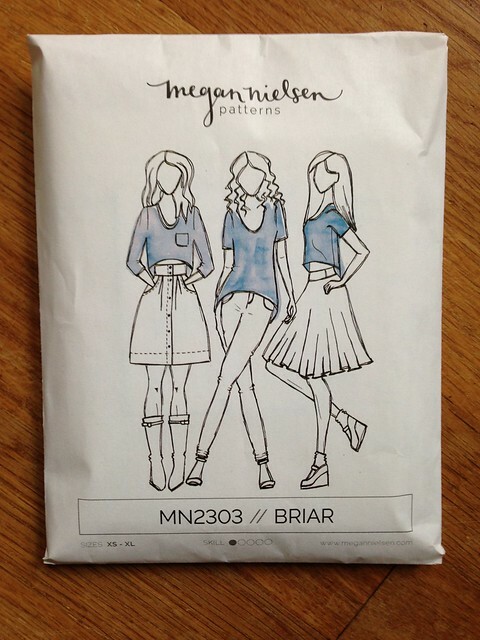 It’s Megan Nielsen’s Briar t-shirt and sweater, this time made from a fleece-backed fabric. You can see my first version of this pattern here. I made this one for my trip to Colorado last month. Since I was planning to wear my other Briar sweater on the plane ride out, this seemed like a good choice for the ride home. I suppose you could call that dorky, but I call it awesome. I already had the pattern ready, the fabric waiting to be used, and I really needed a quick project to whip through after all the time I spent on the outfit I wore to the wedding in Colorado. With all that ready and waiting, it was such a fast project. Super satisfying! As mentioned, I used the pattern below. 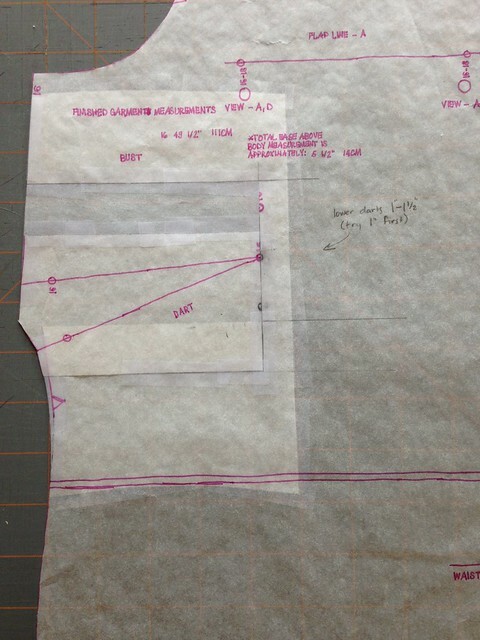 These days I trace out my patterns on tracing paper, which gives me a nice, clean pattern to work with, especially if I am grading between sizes, which I usually do. It was so nice to already have this traced out from the last time. I chose to make a medium at the bust and grade out to a large for the waist and hips. 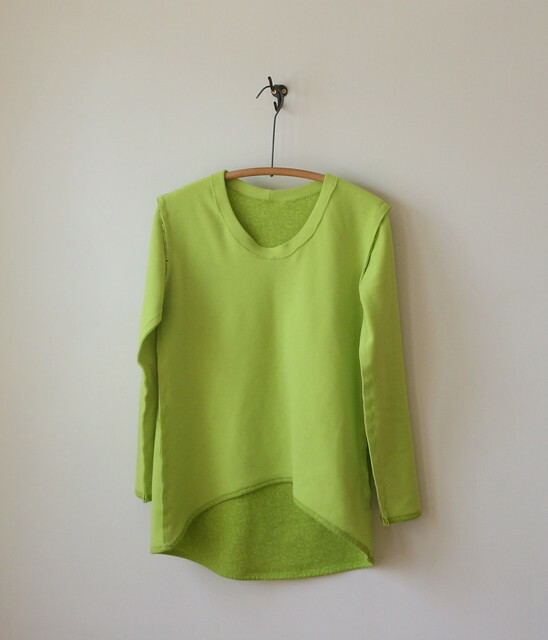 I made Version 4, which is the long-sleeved t-shirt in the longer length. 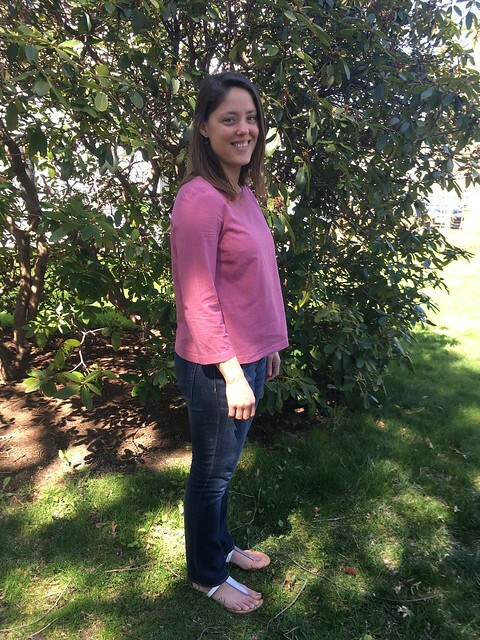 I really like the high-low hem. The fabric for this is pretty cool. I got it this summer at Field’s Fabrics in Kalamazoo, MI. Man, that place is great! This fabric is, I think, made by Polartec. 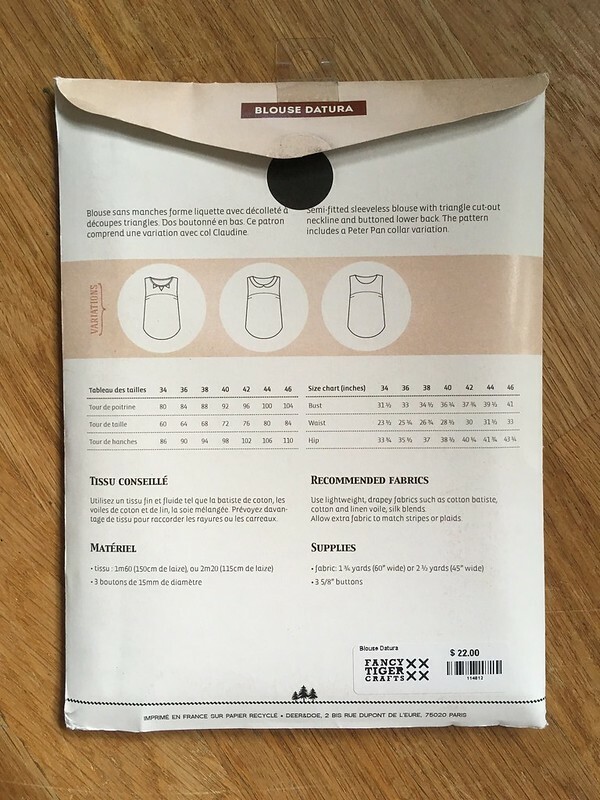 The quality is really great, and makes me only want to sew with their fleece (However if some other company wants to try to convince me their fleece is better, send over the free fabric! I’ll try it, but it’s going to take A LOT to convince me.). 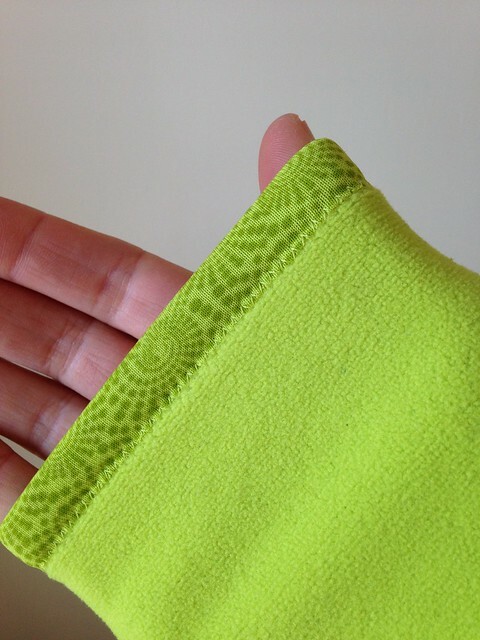 It’s got a fleece inside and a stretchy, smooth outside. It would be perfect for an athletic jacket, but I wanted to try it in another context. When I thought of pairing it with this pattern, it seemed perfect. Here are some detail shots. This time around, I made sure to stabilize the shoulders with ribbon, rather than trying to do that after the fact. I’ve since stabilized the shoulders and back of the neck on my first version of this pattern, but I don’t think it was a huge help since I did it after the fact. I wasn’t going to make that mistake this time (See? 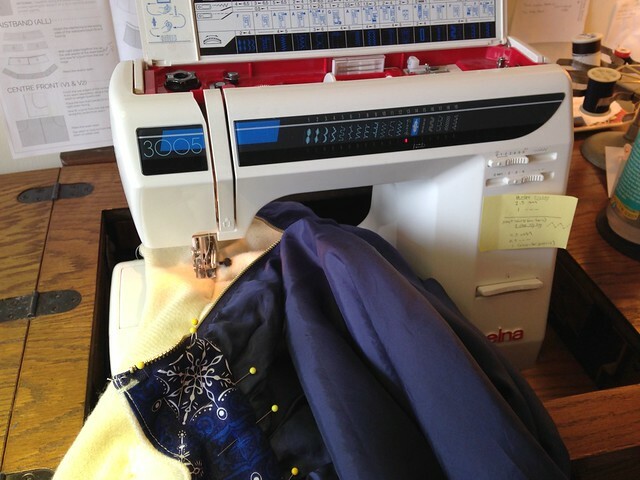 Sewing is LEARNING!). 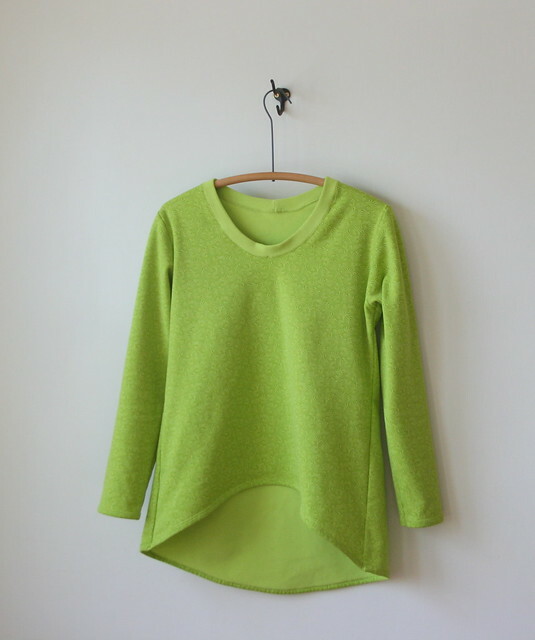 A nice thing about working with knits is that you don’t have to do a lot of finishing of seams and edges. 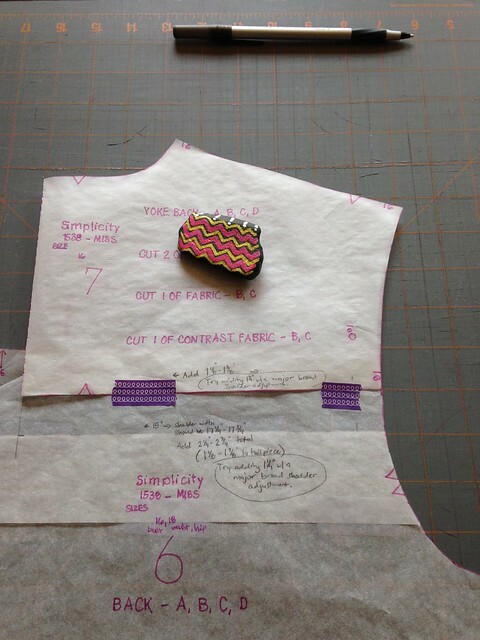 The hem and sleeves are just turned up and zigzagged. I made sure to use a jersey needle and a walking foot to help with the sewing. You may notice in the photo above that my sleeve seam isn’t flat. I sometimes hem the sleeves before sewing the sleeve up. I’m always afraid it will be hard to hem it afterward, even though my machine has a free arm. I haven’t decided if I like this better or not. It’s definitely easier, but I don’t think it looks as nice as sewing the sleeve seam first and doing the sleeve hem after. It doesn’t bother me when I wear it, though, so I keep doing it. And that’s about it! 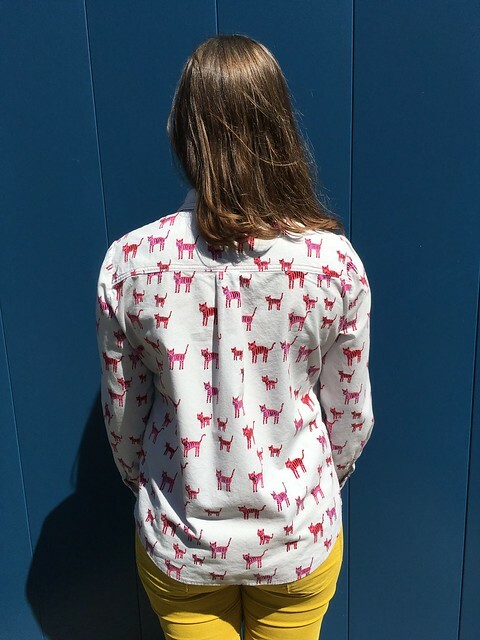 I have one more of these shirts cut out in a jersey knit, so it will be interesting to see if that fits at all differently, since I have noticed some wrinkles that radiate out from the underarms in the versions I’ve already made. I can’t tell if there is a fit issue there that I don’t know about or if it is the fabric I’ve chosen. I guess I can compare them all when the t-shirt is finished. And, last but not least…This is fun now! Here are my fun things for you to check out. Hillcraft Designs on etsy. This one belongs to my friend who is an amazing potter, knitter, and all-around fabulous maker of a billion things. Jo-Alice is a one in a million person and a one in a million maker. My parents have ordered pottery from her and I bought some for my best friends for Christmas. It was beautiful, and they loved it. She has helped me in my knitting, my baking, and in all of life, really. I highly recommend her work! For your reading pleasure, check out Ask the Past by Elizabeth P. Archibald. I really love funny things. The author of this book found advice throughout history and has compiled it, with comments for all of us. It contains gems like the usefulness of bacon for curing wounds, how to get sympathy after giving birth (hint: scream really loud! ), and a caution to not smell too much basil (you might end up with a scorpion in your brain!). We checked out a copy from our library, so you can check yours to see if they have it, too. Last, but not least, and continuing on the “funny” theme, this is currently my favorite sketch from The Tonight Show with Jimmy Fallon. Makes me laugh so hard I cry pretty much every time.